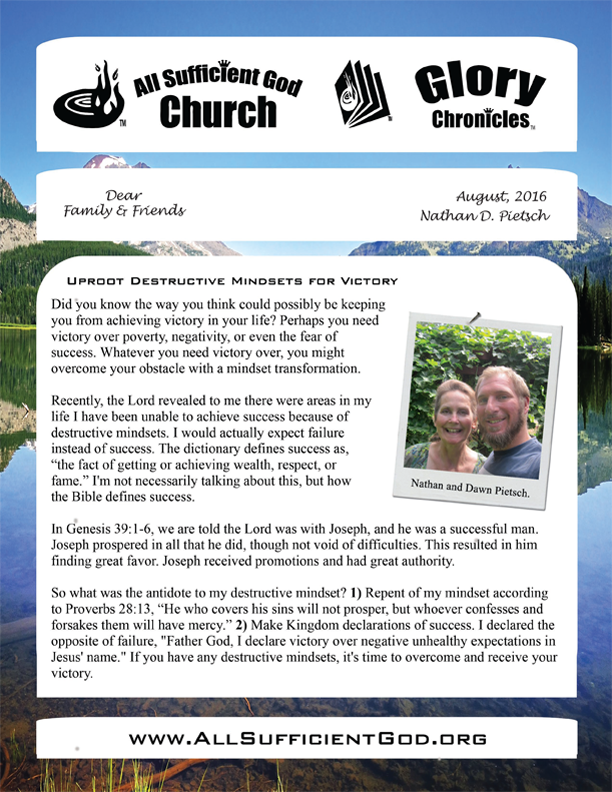 We want to welcome you to Frontline Chronicles, the monthly publication of All Sufficient God Church. 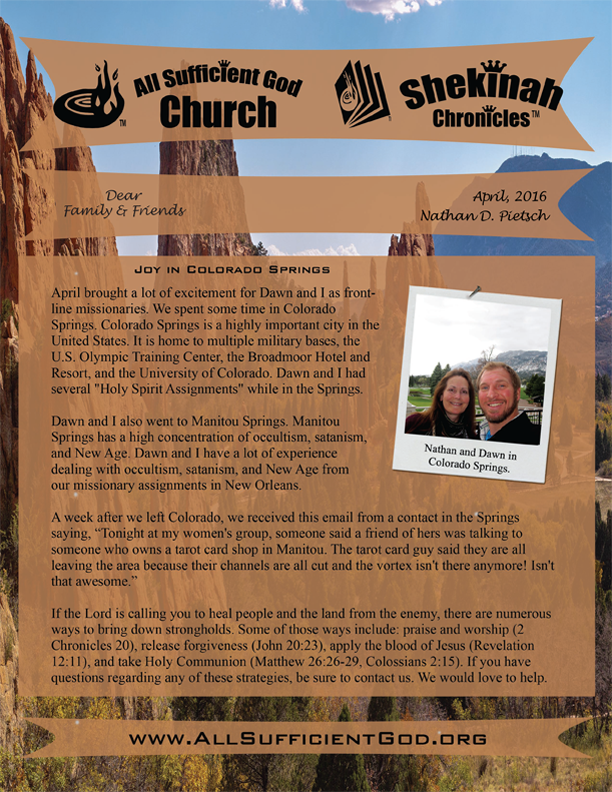 This church was founded by Nathan and Dawn Pietsch, frontline missionaries. 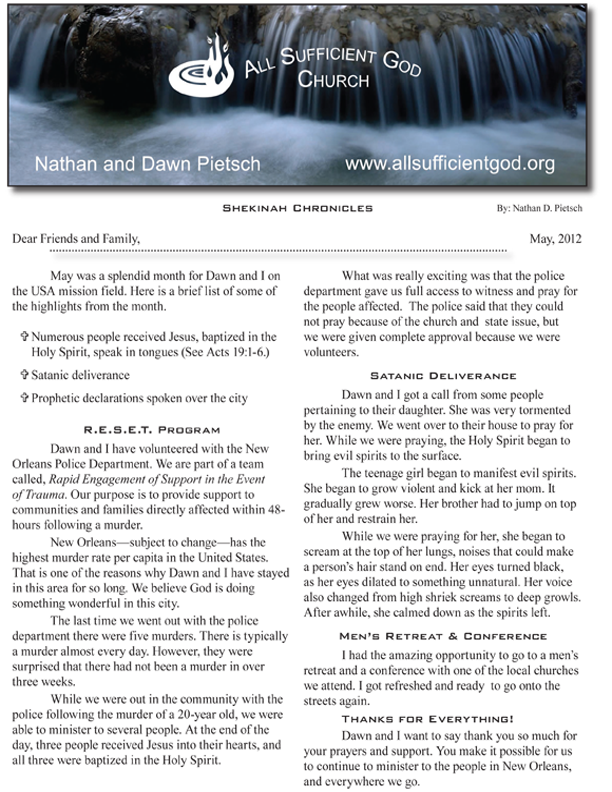 Every month All Sufficient God Church releases an update from the mission field on what God is doing through this ministry. 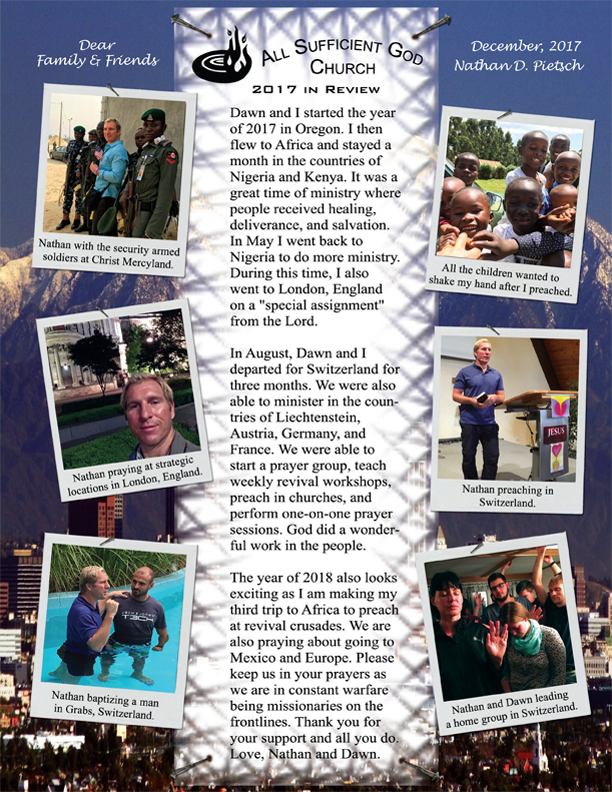 As frontline missionaries, Nathan and Dawn have ministered around the world. They are full-time missionaries with a heart for worldwide revival. Their emphasis is to take the love of God onto the streets and into the marketplace to give people a personal encounter with the Heavenly Father, Jesus Christ, and Holy Spirit. Nathan and Dawn have ministered to witches, Voodoo queens, prostitutes, gang members, drug addicts, bank robbers, and demon possessed people. 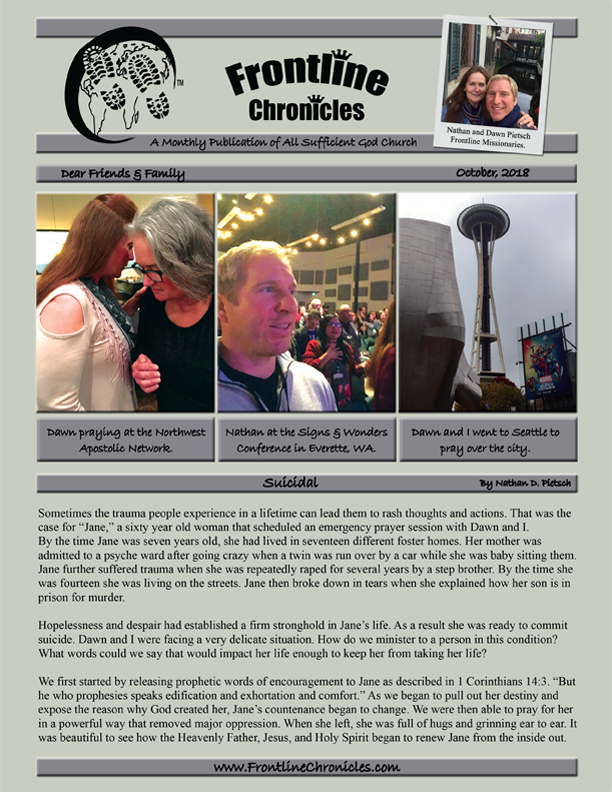 Inside Frontline Chronicles you will read about their powerful testimonies, receive prophetic insight, increase faith, and be encouragement. 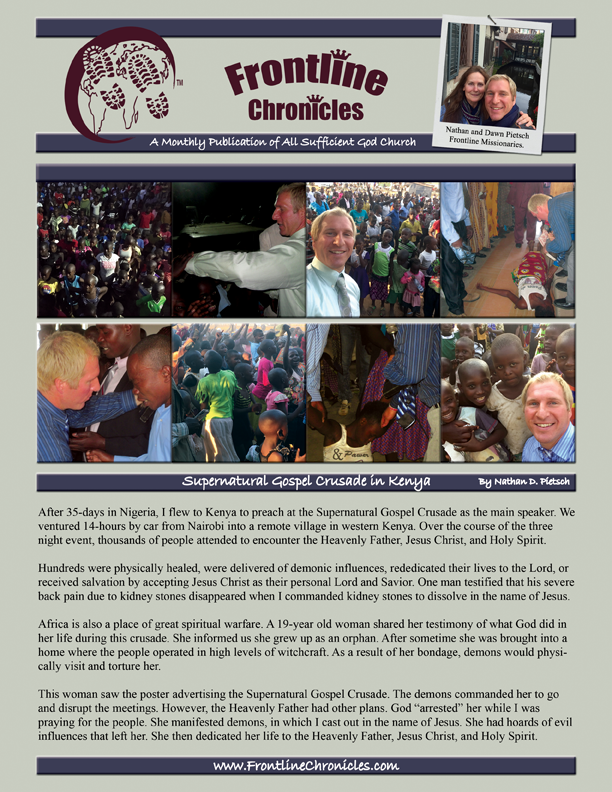 Frontline Chronicles initially started as, Shekinah Chronicles in the year of 2010. 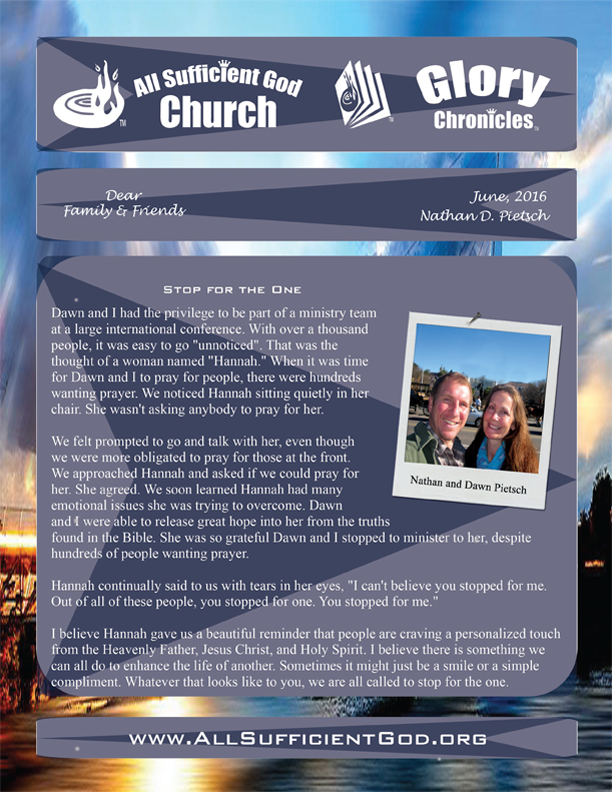 In June of 2016, Shekinah Chronicles changed to Glory Chronicles. 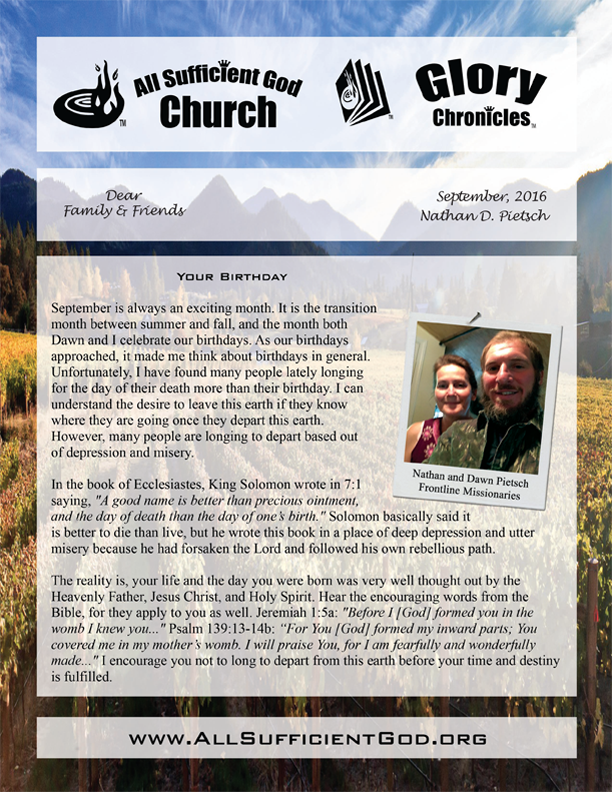 In January of 2018, the monthly publication of All Sufficient God Church found its permanent name in Frontline Chronicles. We hope you find edification, exhortation, and comfort inside each page. 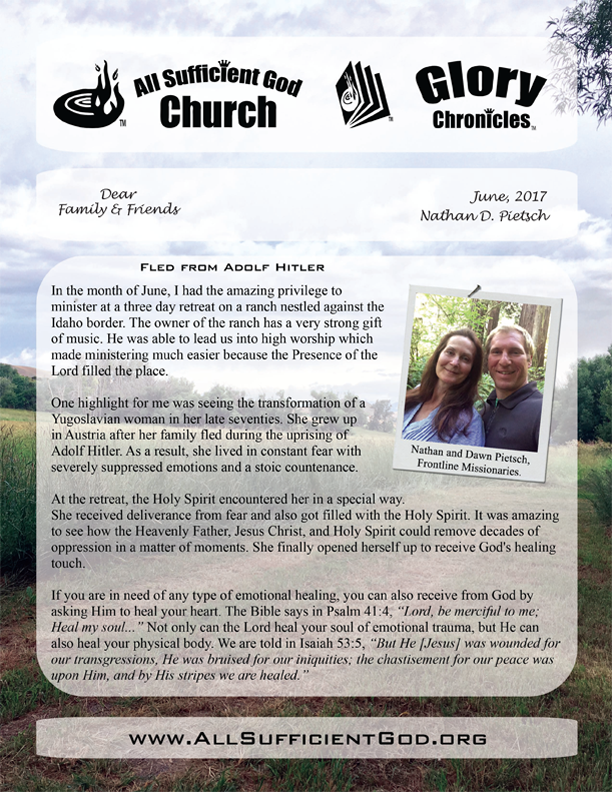 If you would like to sign up for the free Frontline Chronicles' monthly newsletter you can by clicking here. Download the online version from April, 2019. Download a printable PDF version from April, 2019. View the Photo Gallery for April, 2019. 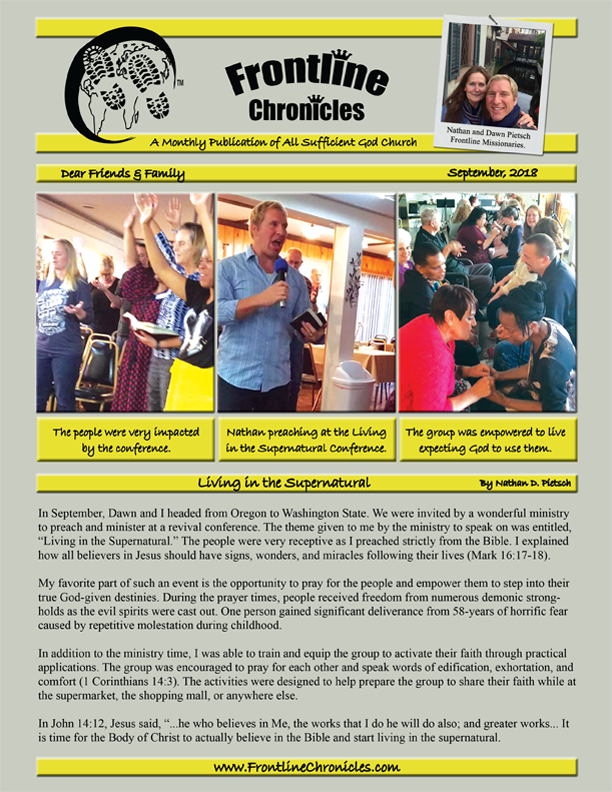 Download the online version from March, 2019. Download a printable PDF version from March, 2019. View the Photo Gallery for March, 2019. Download the online version from February, 2019. Download a printable PDF version from February, 2019. View the Photo Gallery for February, 2019. 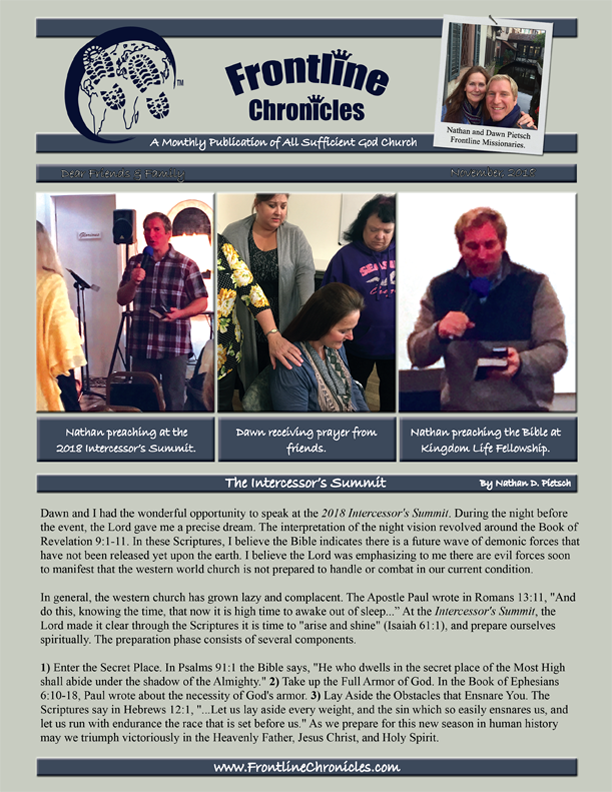 Download the online version from January, 2019. Download a printable PDF version from January, 2019. View the Photo Gallery for January, 2019. Download the online version from December, 2018. Download a printable PDF version from December, 2018. View the Photo Gallery for December, 2018. Download the online version from November, 2018. Download a printable PDF version from November, 2018. View the Photo Gallery for November, 2018. Download the online version from October, 2018. Download a printable PDF version from October, 2018. View the Photo Gallery for October, 2018. Download the online version from September, 2018. Download a printable PDF version from September, 2018. View the Photo Gallery for September, 2018. Download the online version from August, 2018. Download a printable PDF version from August, 2018. View the Photo Gallery for August, 2018. Download the online version from July, 2018. Download a printable PDF version from July, 2018. View the Photo Gallery for July, 2018. Download the online version from June, 2018. Download a printable PDF version from June, 2018. View the Photo Gallery for June, 2018. Download the online version from May, 2018. Download a printable PDF version from May, 2018. Download the online version from April, 2018. Download a printable PDF version from April, 2018. 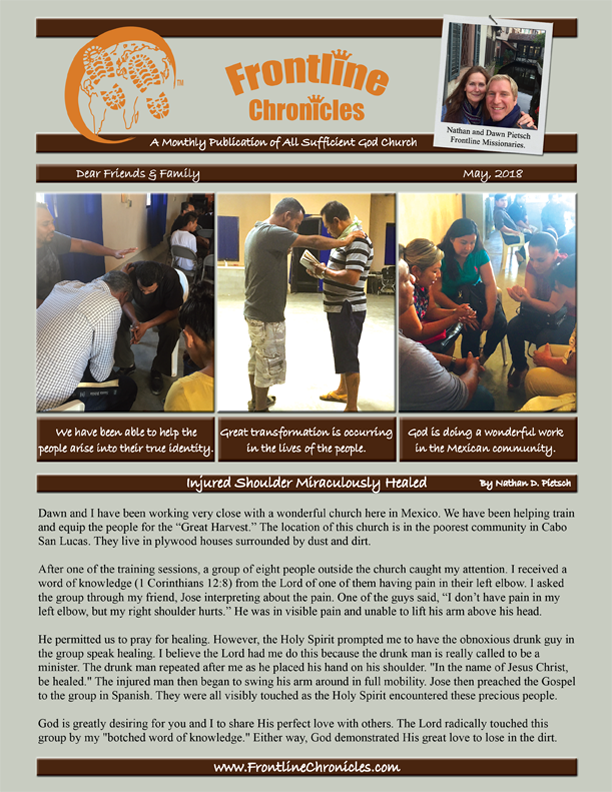 Download the online version from March, 2018. Download a printable PDF version from March, 2018. Download the online version from February, 2018. Download a printable PDF version from February, 2018. Download the online version from January, 2018. Download a printable PDF version from January, 2018. God worked amazing exploits in 2017. 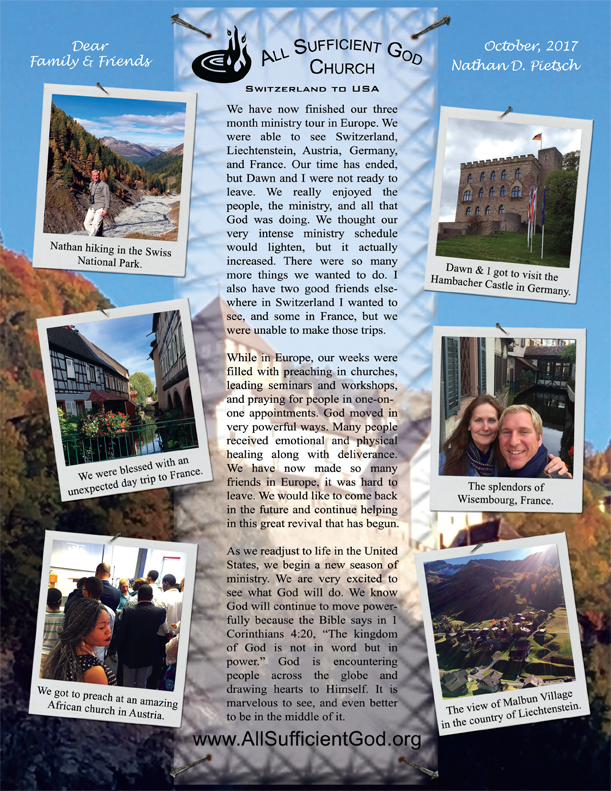 As you read the articles below, you will learn about what God did in the beautiful countries of Switzerland, Liechtenstein, Austria, Germany, and France through Nathan and Dawn Pietsch. You will read about a personal and moving testimony of a woman who had to flee from Adolf Hitler while she was a child. 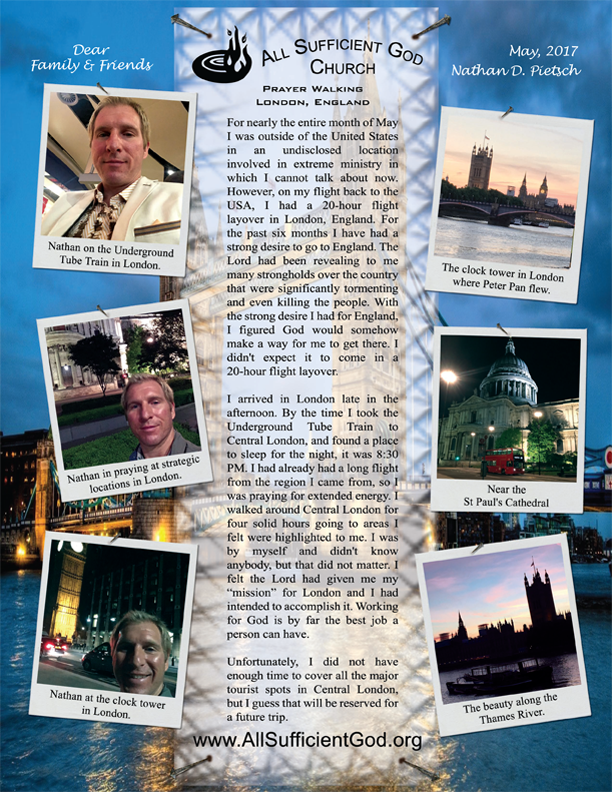 In the month of May, you will discover how Nathan had a special assignment from the Lord to strategically walk to various landmarks throughout London, England and pray over specific areas. 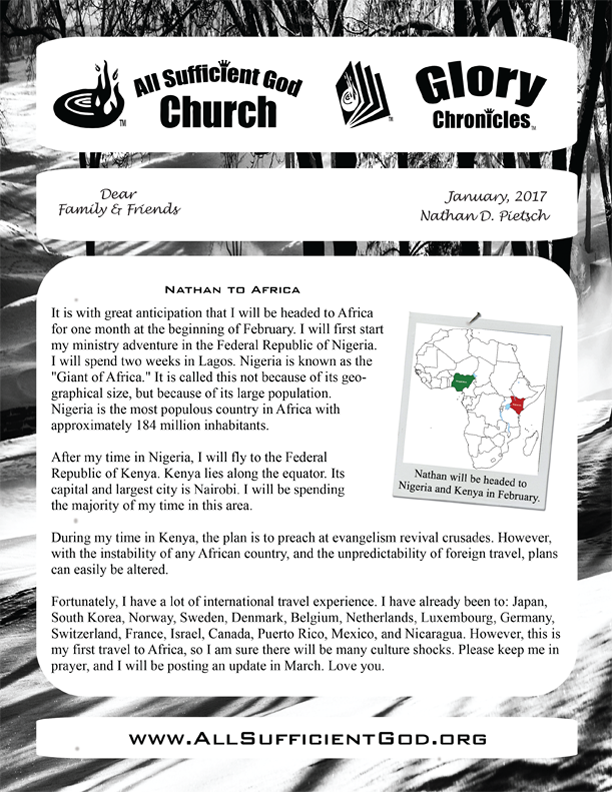 You will also enjoy reading the revival adventures Nathan had while in the African countries of Nigeria and Kenya. Download the online version from December, 2017. Download a printable PDF version from December, 2017. Title: Have You Lost Your Voice? 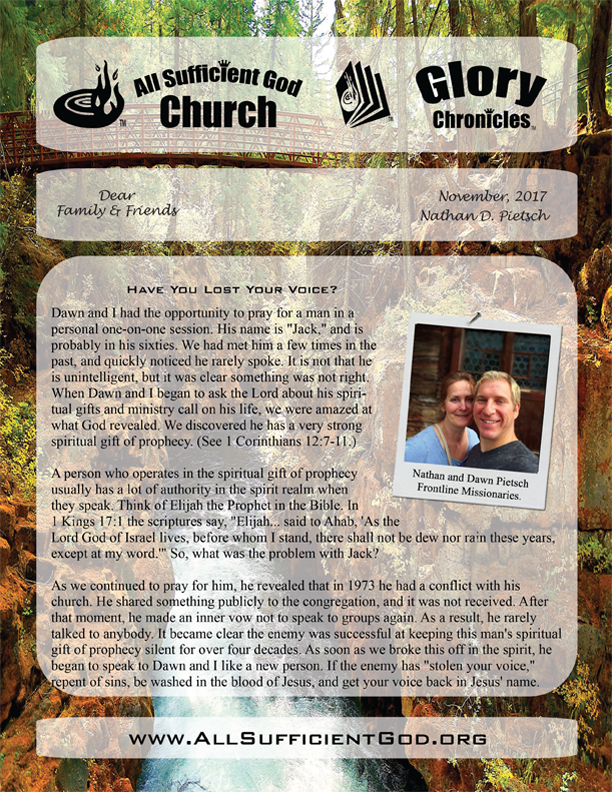 Download the online version from November, 2017. Download a printable PDF version from November, 2017. Download the online version from October, 2017. Download a printable PDF version from October, 2017. Download the online version from September, 2017. Download a printable PDF version from September, 2017. Download the online version from August, 2017. Download a printable PDF version from August, 2017. 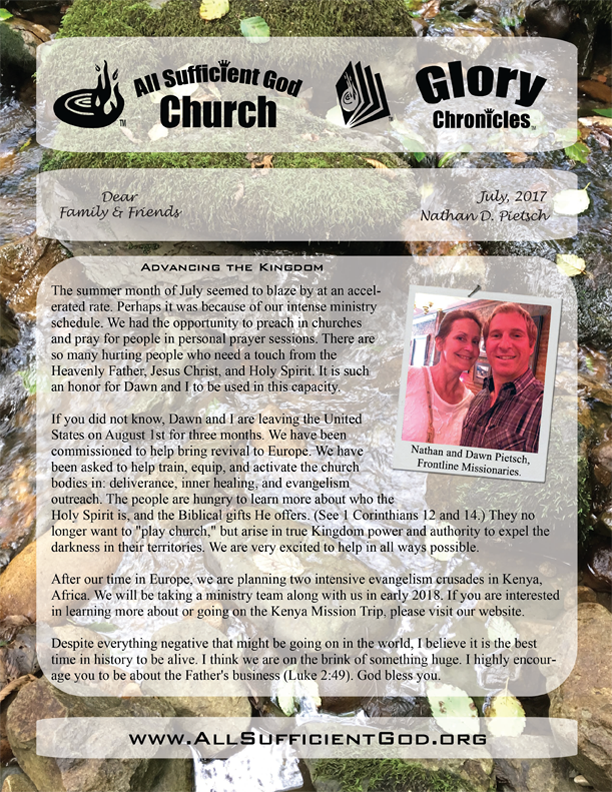 Download the online version from July, 2017. Download a printable PDF version from July, 2017. Download the online version from June, 2017. Download a printable PDF version from June, 2017. Download the online version from May, 2017. Download a printable PDF version from May, 2017. Download the online version from April, 2017. Download a printable PDF version from April, 2017. 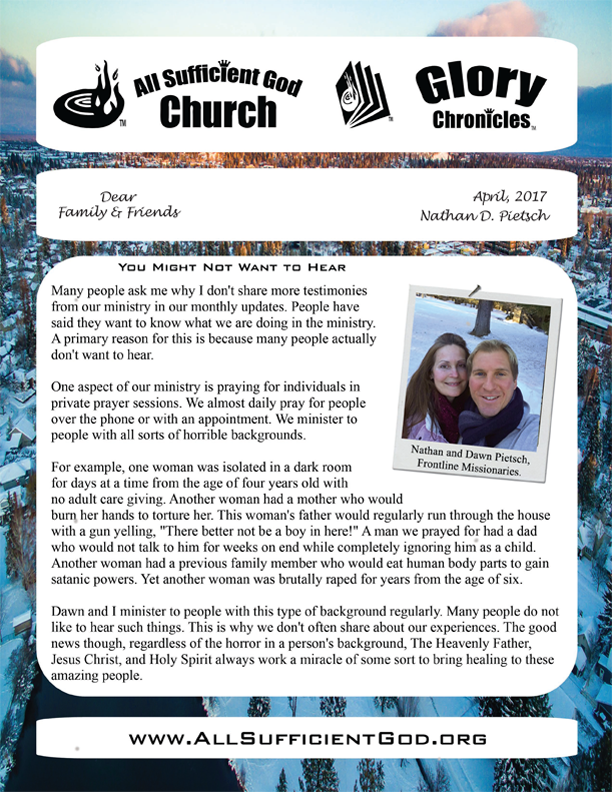 Download the online version from March, 2017. Download a printable PDF version from March, 2017. Download the online version from February, 2017. Download a printable PDF version from February, 2017. Download the online version from January, 2017. 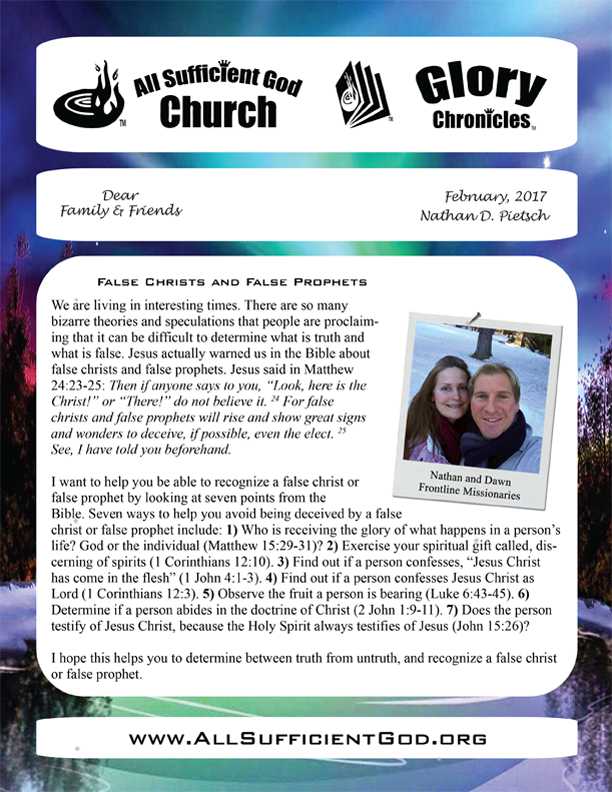 Download a printable PDF version from January, 2017. The year of 2016 was a time to remember. 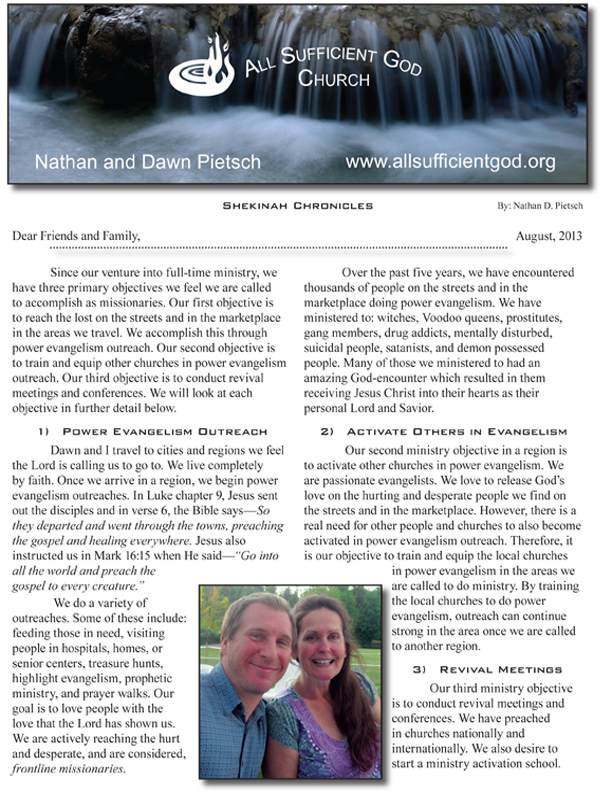 You can read about Nathan and Dawn's ministry experiences around the United States. 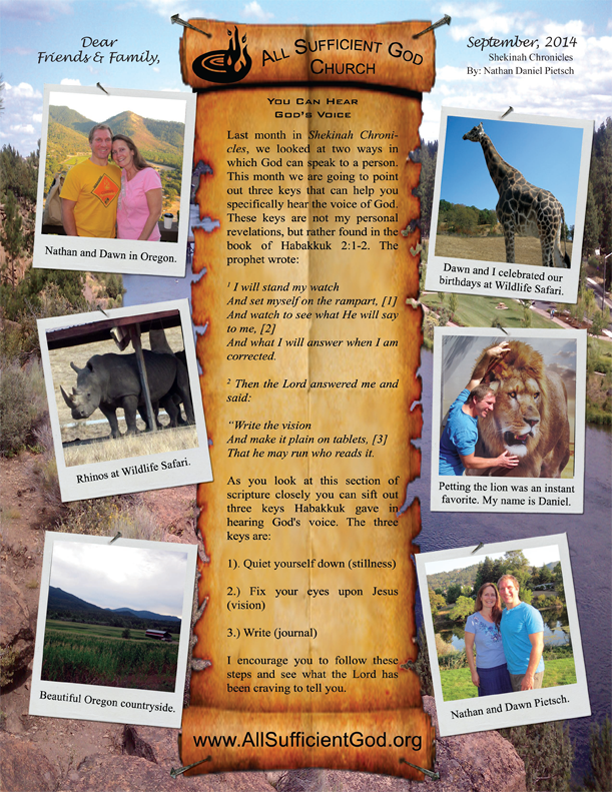 The Lord gave them specific ministry assignments in Colorado Springs and St. Louis, Missouri. You will also find out how Nathan and Dawn cleansed the Oklahoma land where a massacre of the Osage Native American Tribe occurred from 1921-1925. Nathan and Dawn also had the privilege to release God's Kingdom in Sedona, Arizona at the "center of the New Age superstore." 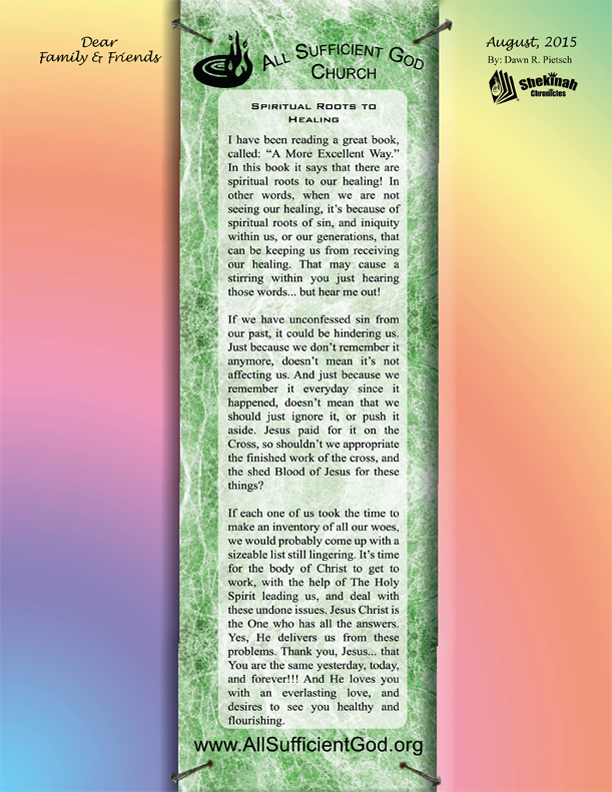 In addition to these ministry adventrues, you will be strengthened by reading words of encouragment and edification that will warm your heart. Download the online version from December, 2016. Download a printable PDF version from December, 2016. Title: Do You Need a God Encounter? Download the online version from November, 2016. Download a printable PDF version from November, 2016. Download the online version from October, 2016. Download a printable PDF version from October, 2016. Download the online version from September, 2016. Download a printable PDF version from September, 2016. Download the online version from August, 2016. Download a printable PDF version from August, 2016. Download the online version from July, 2016. Download a printable PDF version from July, 2016. Download the online version from June, 2016. Download a printable PDF version from June, 2016. Download the online version from May, 2016. Download a printable PDF version from May, 2016. Download the online version from April, 2016. Download a printable PDF version from April, 2016. Download the online version from March, 2016. Not Available. Download a printable PDF version from March, 2016. Download the online version from February, 2016. Download a printable PDF version from February, 2016. Download the online version from January, 2016. Download a printable PDF version from January, 2016. The year 2015 held many wonderful surprises, adventures, and excitement. 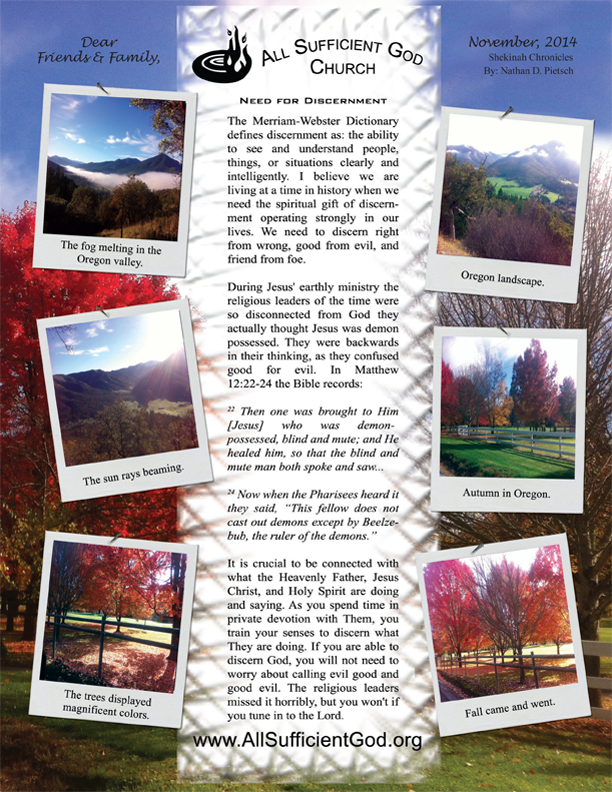 Our primary geographic locations of ministry consisted of numerous cities throughout Oregon and California. 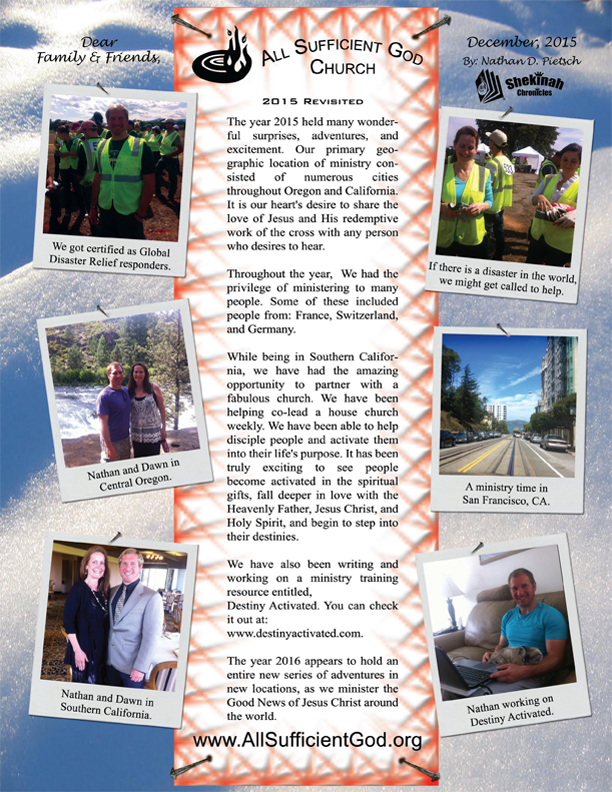 Throughout the year, we had the privilege of ministering to many people. 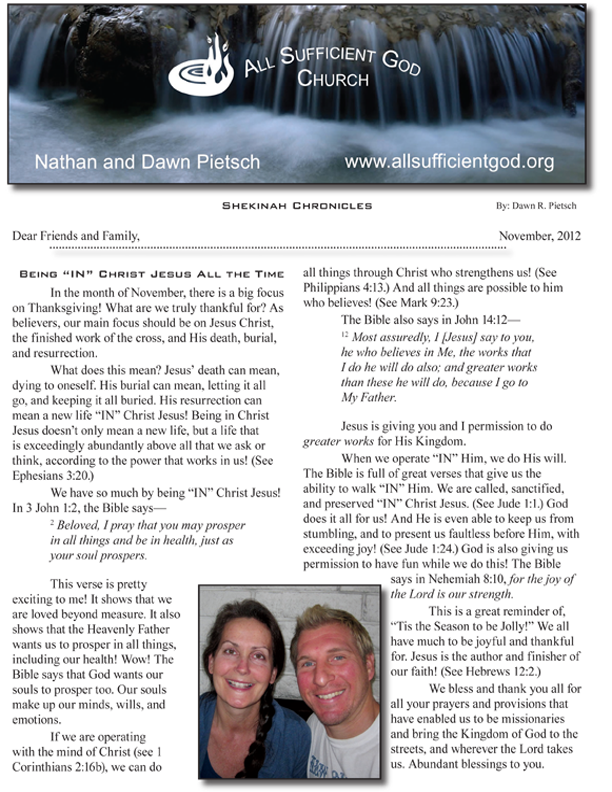 You will read about how they cleared a house of a demonic spirit, and how God instantly healed a person's nasal canal. Also, while in Southern California, we had the great opportunity to partner with a fabulous church. While partnering with the church, we helped co-lead a house church. During this time we were able to help disciple people while helping launch them into their life's purpose and destiny. Download the online version from December, 2015. Download a printable PDF version from December, 2015. 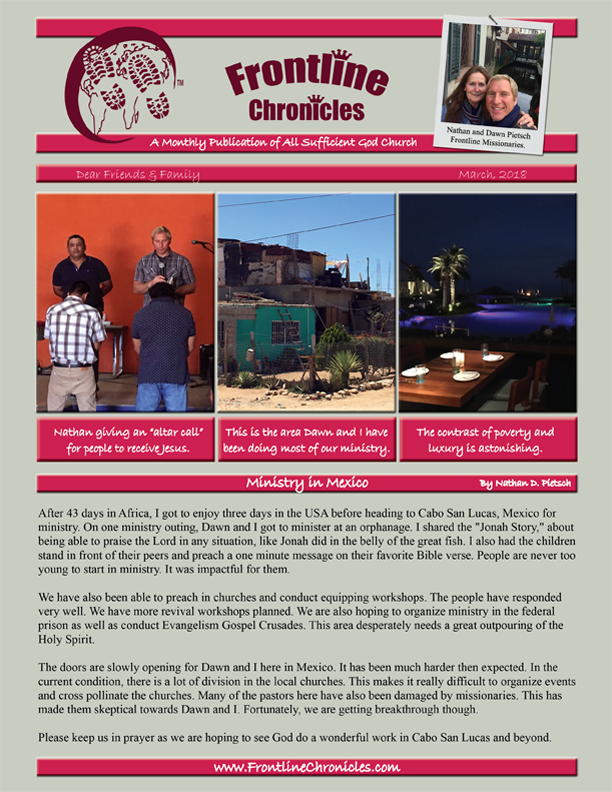 Download the online version from November, 2015. Download a printable PDF version from November, 2015. Download the online version from October, 2015. Download a printable PDF version from October, 2015. Title: Praying for a Haunted House? Download the online version from September, 2015. Download a printable PDF version from September, 2015. Download the online version from August, 2015. Download a printable PDF version from August, 2015. 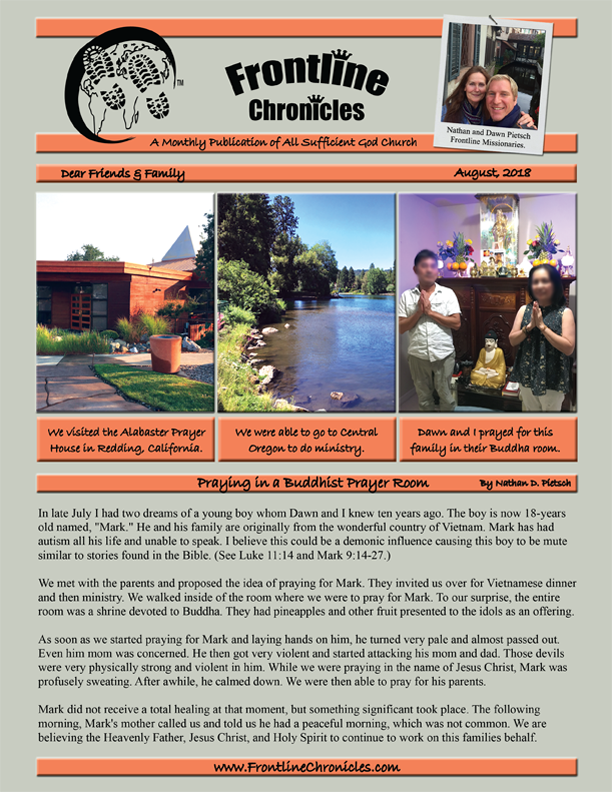 Download the online version from July, 2015. Download a printable PDF version from July, 2015. 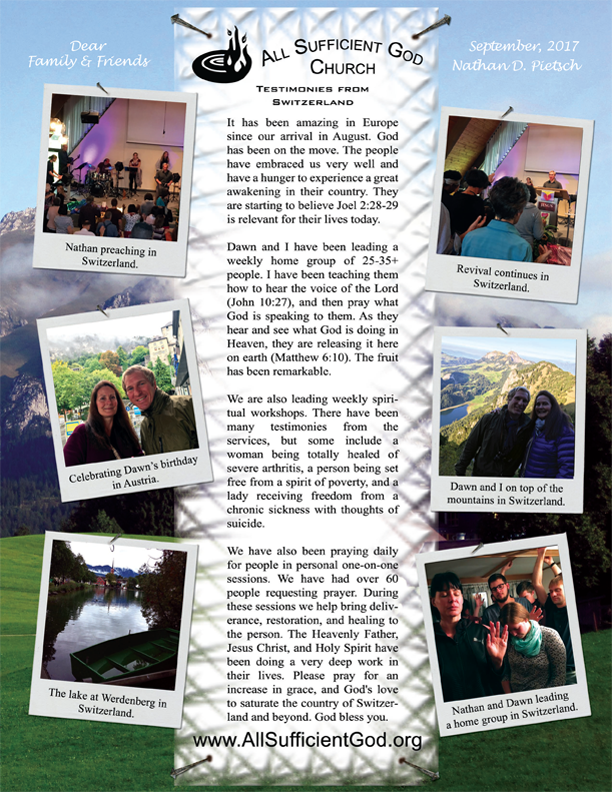 Download the online version from June, 2015. Download a printable PDF version from June, 2015. Title: Are Signs in the Heavens Speaking? Download the online version from May, 2015. Download a printable PDF version from May, 2015. 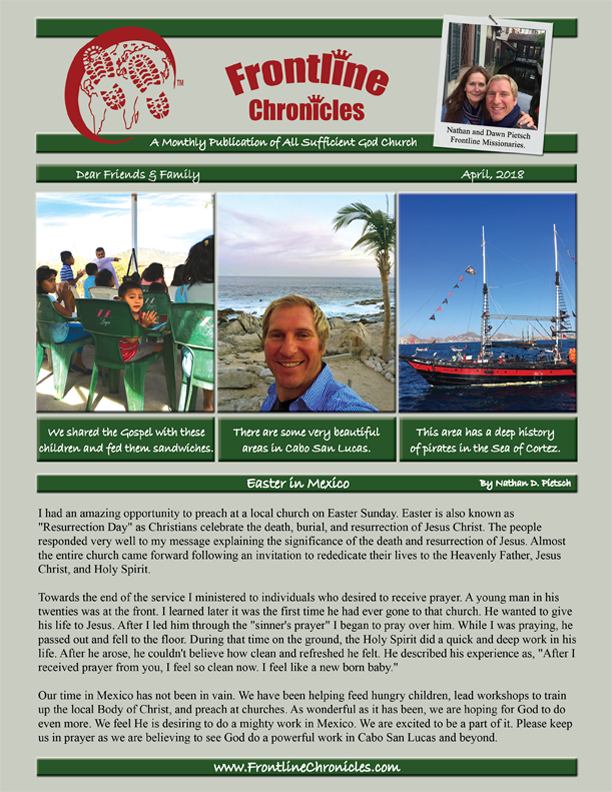 Download the online version from April, 2015. Download a printable PDF version from April, 2015. Download the online version from March, 2015. Download a printable PDF version from March, 2015. Download the online version from February, 2015. Download a printable PDF version from February, 2015. Title: Need a Heart Change? Download the online version from January, 2015. Download a printable PDF version from January, 2015. 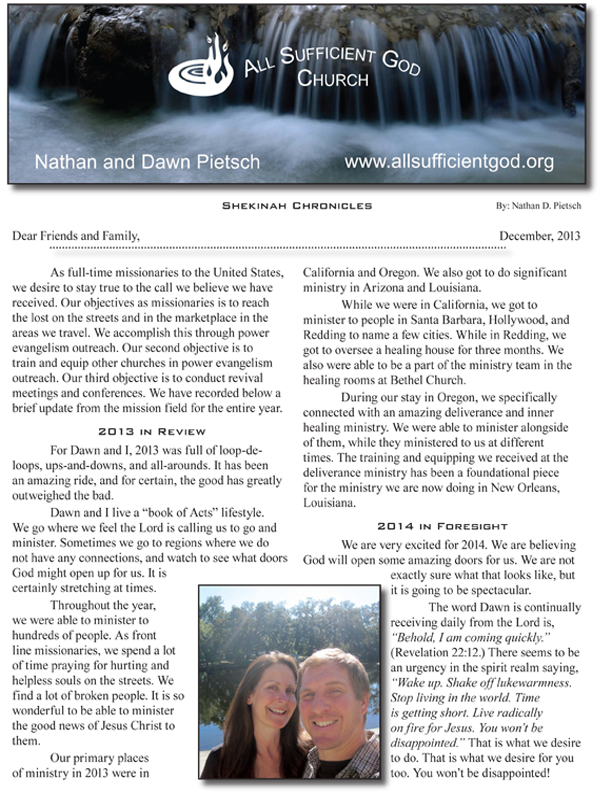 Nathan and Dawn Pietsch started 2014 in Louisiana. They stayed the first five months in New Orleans on a very difficult mission assignment. 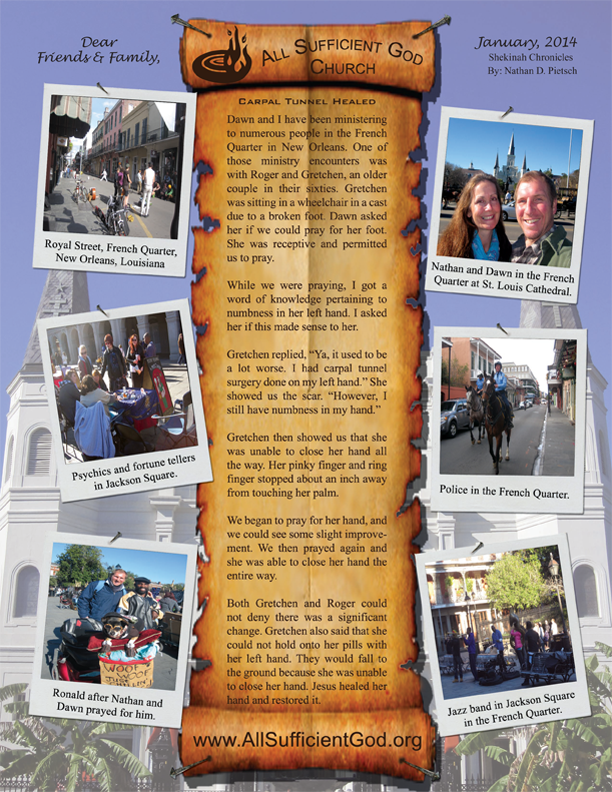 They spent hours a day on the streets in the French Quarter praying for people where many received physical and spiritual healings. 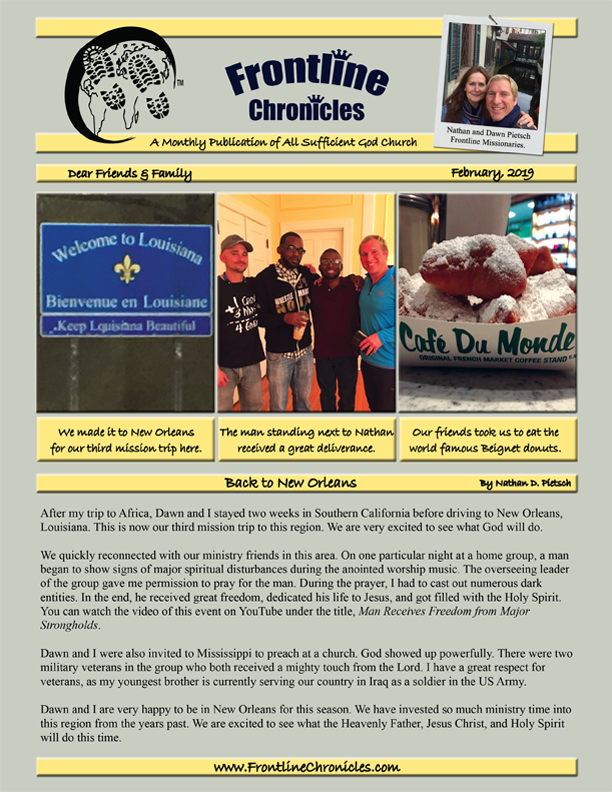 You can read about their New Orlean mission assignment in the chronicles below. 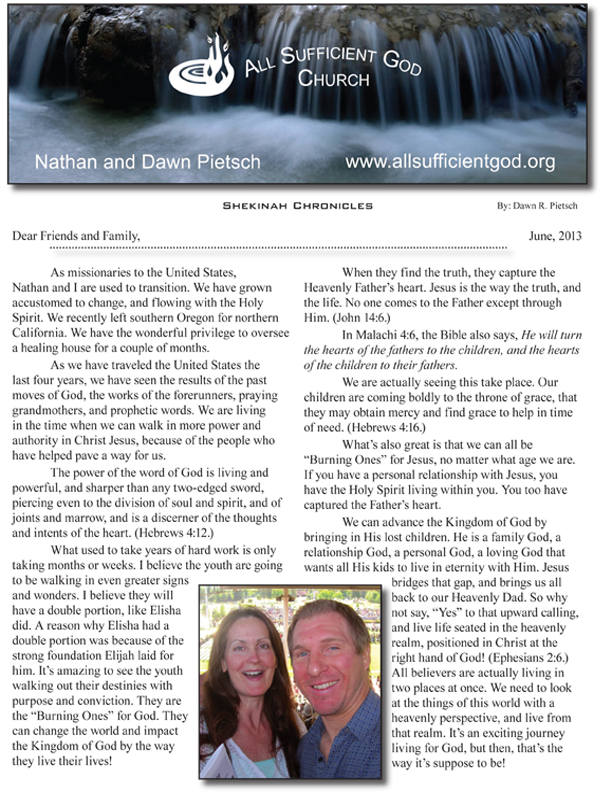 After their time in New Orleans, Nathan and Dawn spent several months throughout California where they helped extensively with a homeless ministry in the Palm Springs area. It was wonderful to see people with no hope, peace, or joy receive transformation through the power of Jesus Christ. 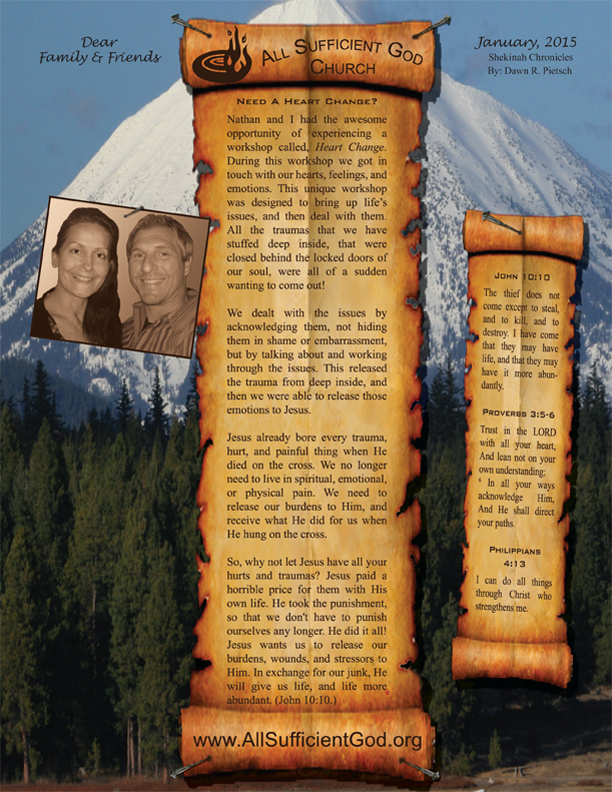 Their final months of 2014 were spent in Oregon. 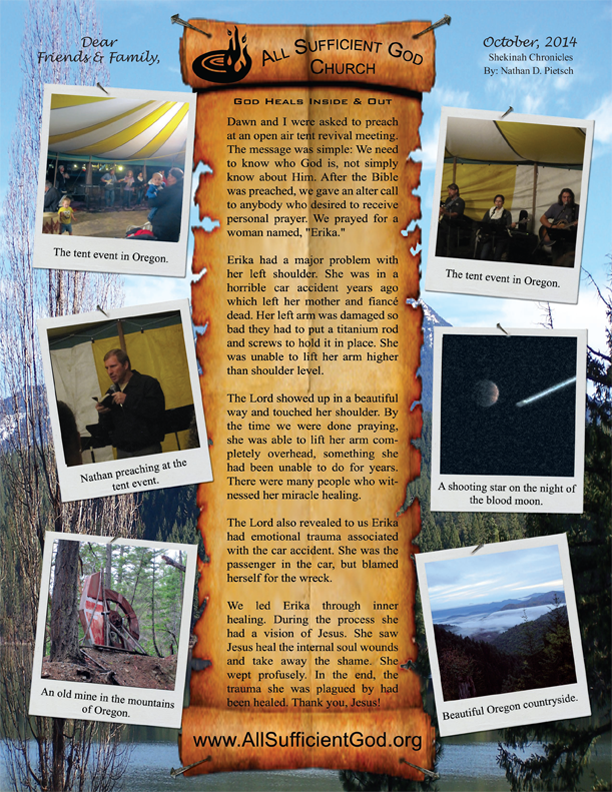 While in Oregon they assisted at an inner healing and deliverance ministry. 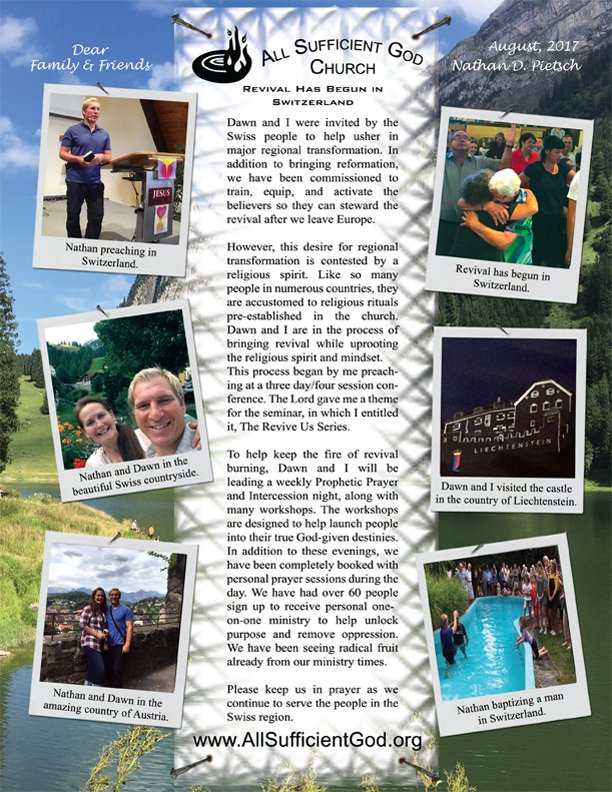 People from all walks of life came to receive emotional, physical, and spiritual healing. It is amazing to see Jesus set people free. 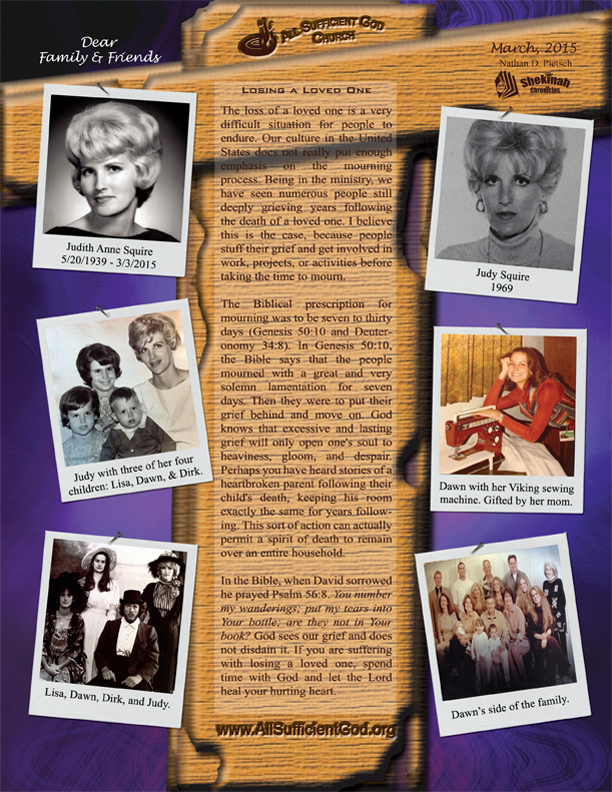 You can read about these stories and others by clicking on the links below. Download the online version from December, 2014. Not Available. Download a printable PDF version from December, 2014. Download the online version from November, 2014. Not Available. Download a printable PDF version from November, 2014. Download the online version from October, 2014. Not Available. Download a printable PDF version from October, 2014. Download the online version from September, 2014. Not Available. Download a printable PDF version from September, 2014. Download the online version from August, 2014. Not Available. Download a printable PDF version from August, 2014. Download the online version from July, 2014. Not Available. Download a printable PDF version from July, 2014. Download the online version from June, 2014. Not Available. Download a printable PDF version from June, 2014. Download the online version from May, 2014. Not Available. Download a printable PDF version from May, 2014. Download the online version from April, 2014. Not Available. Download a printable PDF version from April, 2014. 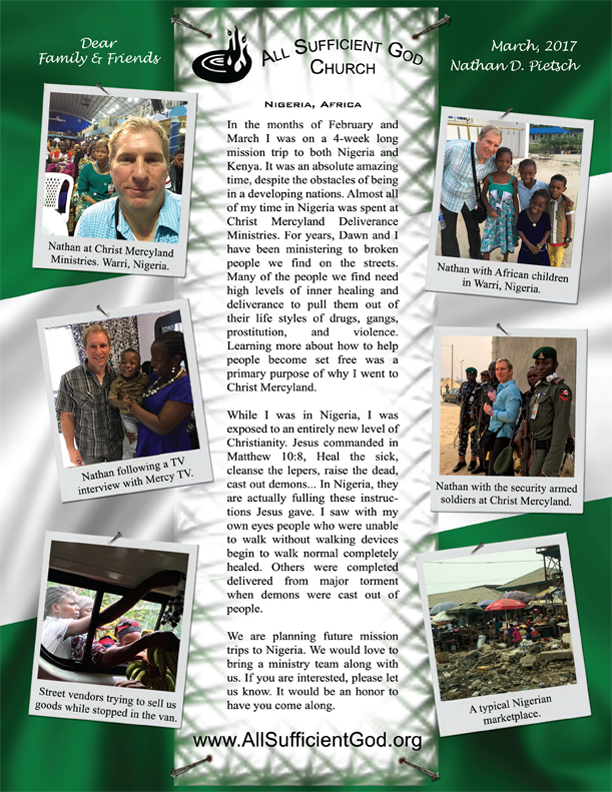 Download the online version from March, 2014. Not Available. Download a printable PDF version from March, 2014. Download the online version from February, 2014. Not Available. Download a printable PDF version from February, 2014. 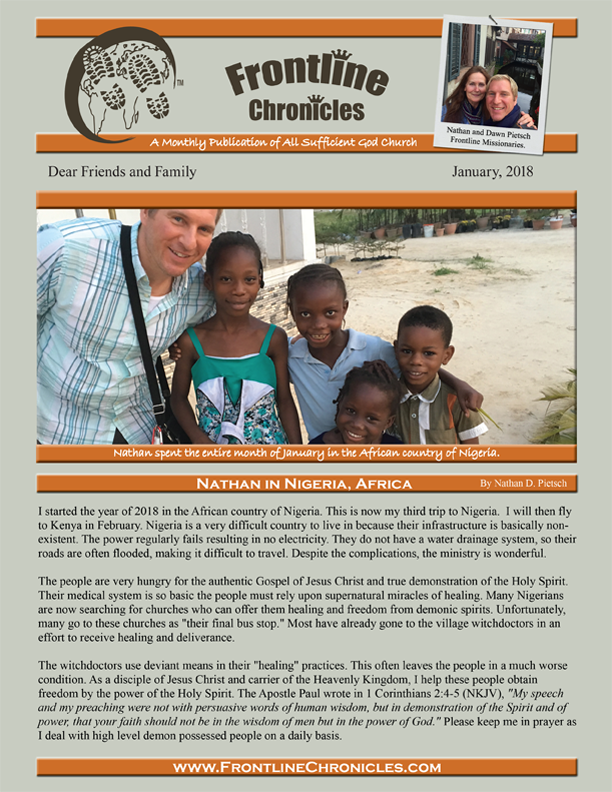 Download the online version from January, 2014. Not Available. Download a printable PDF version from January, 2014. 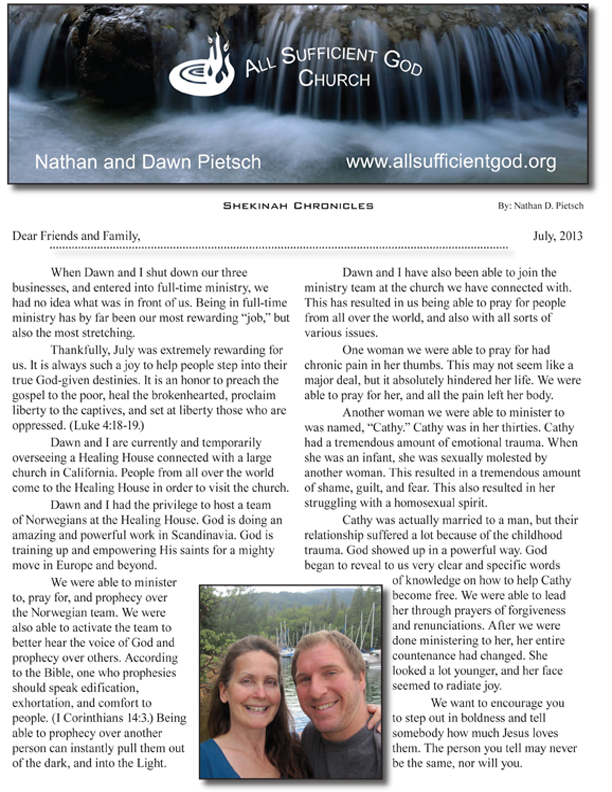 In the year of 2013, Nathan and Dawn's primary places of ministry were in the states of California and Oregon. However, they were also able to do significant ministry in Arizona and Louisiana. While in California, they ministered to people in Santa Barbara, Hollywood, and Redding to name a few cities. 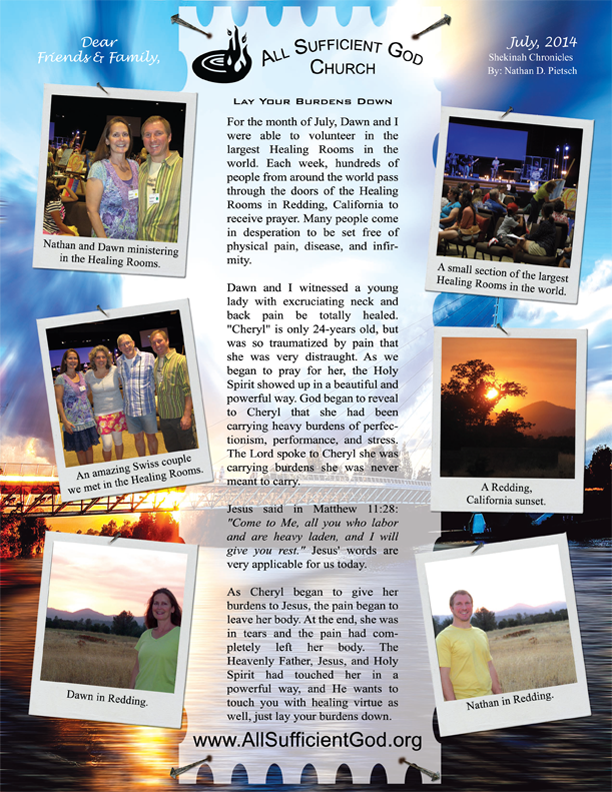 While in Redding, they got to oversee a Healing House for three months, while being a part of the ministry team in the Healing Rooms at Bethel Church. 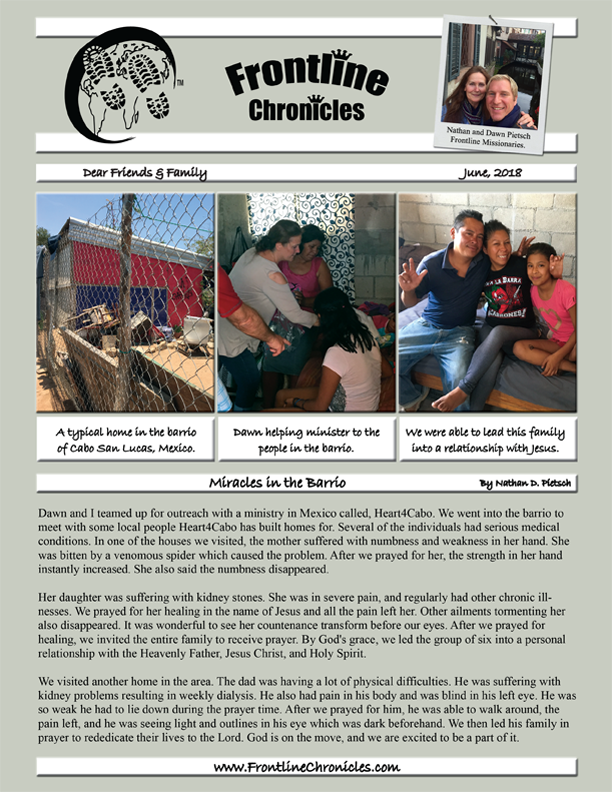 You can read about their experiences by clicking the chronicles below. Download the online version from December, 2013. Not Available. Download a printable PDF version from December, 2013. 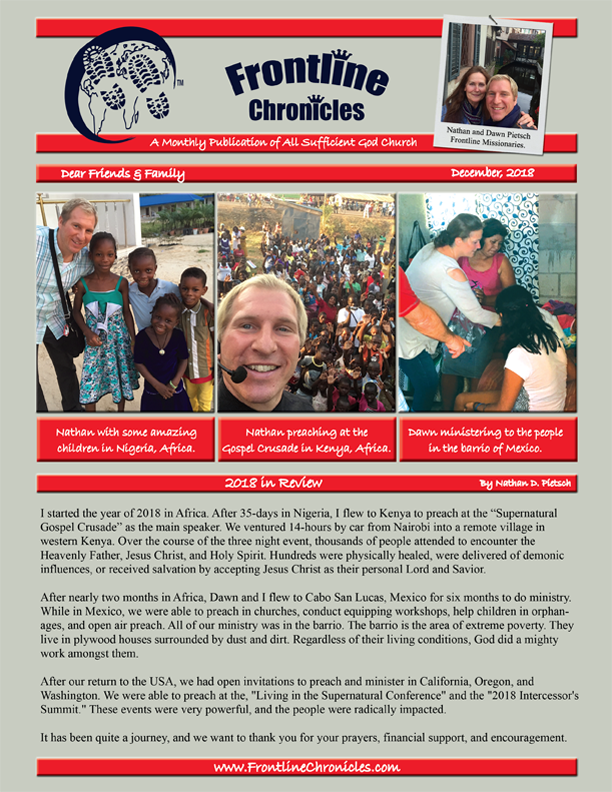 Download the online version from November, 2013. Not Available. Download a printable PDF version from November, 2013. Download the online version from October, 2013. Not Available. 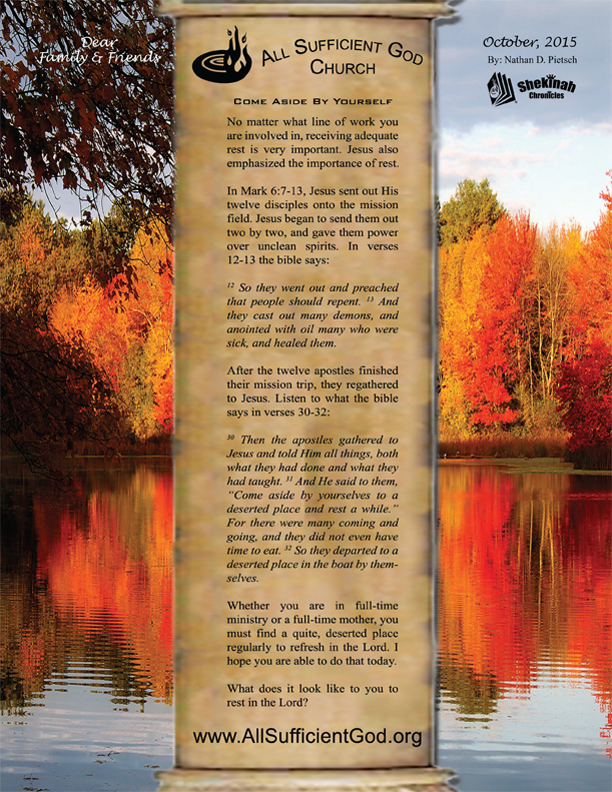 Download a printable PDF version from October, 2013. Download the online version from September, 2013. Not Available. Download a printable PDF version from September, 2013. Download the online version from August, 2013. Not Available. Download a printable PDF version from August, 2013. Download the online version from July, 2013. Not Available. Download a printable PDF version from July, 2013. Download the online version from June, 2013. Not Available. Download a printable PDF version from June, 2013. Download the online version from May, 2013. Not Available. Download a printable PDF version from May, 2013. Download the online version from April, 2013. Not Available. Download a printable PDF version from April, 2013. Download the online version from March, 2013. Not Available. 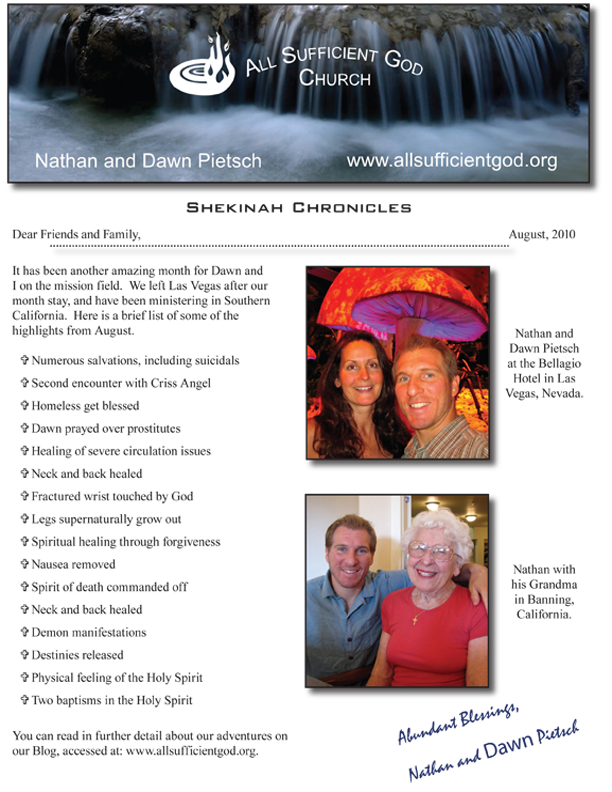 Download a printable PDF version from March, 2013. Download the online version from February, 2013. Not Available. 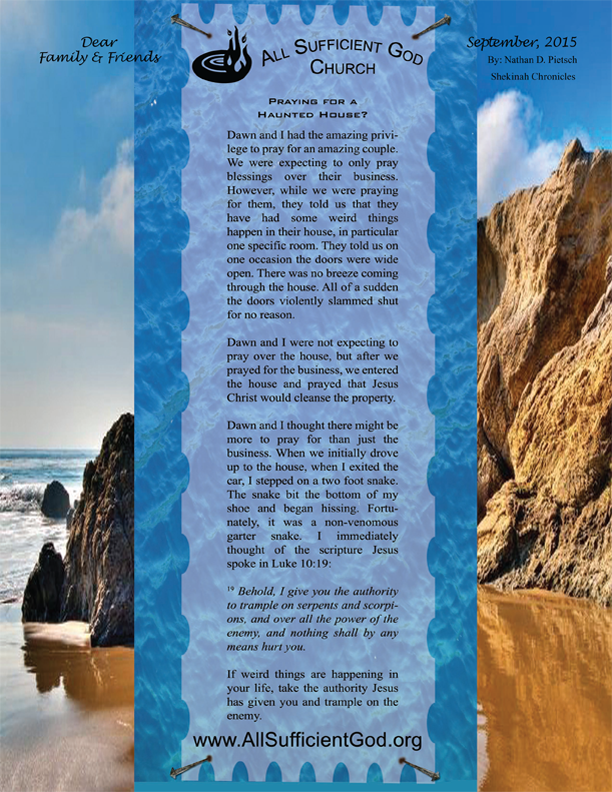 Download a printable PDF version from February, 2013. Download the online version from January, 2013. Not Available. 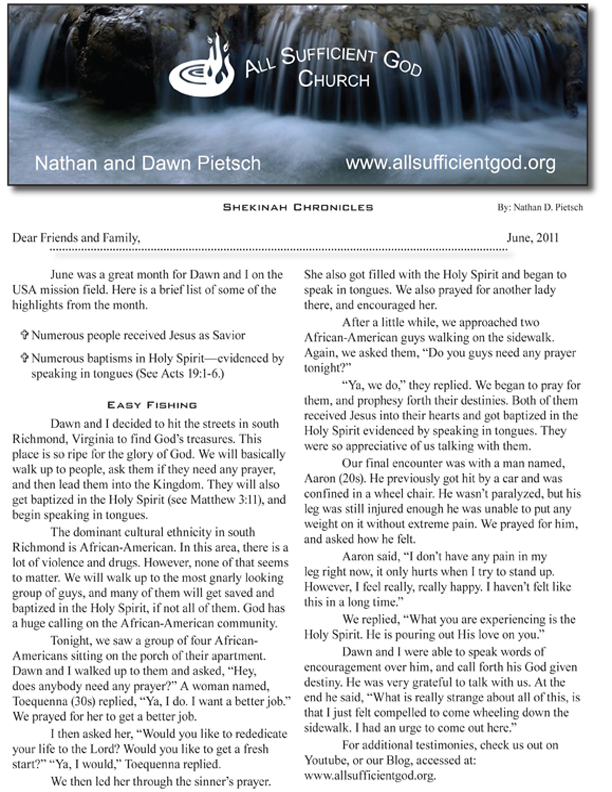 Download a printable PDF version from January, 2013. 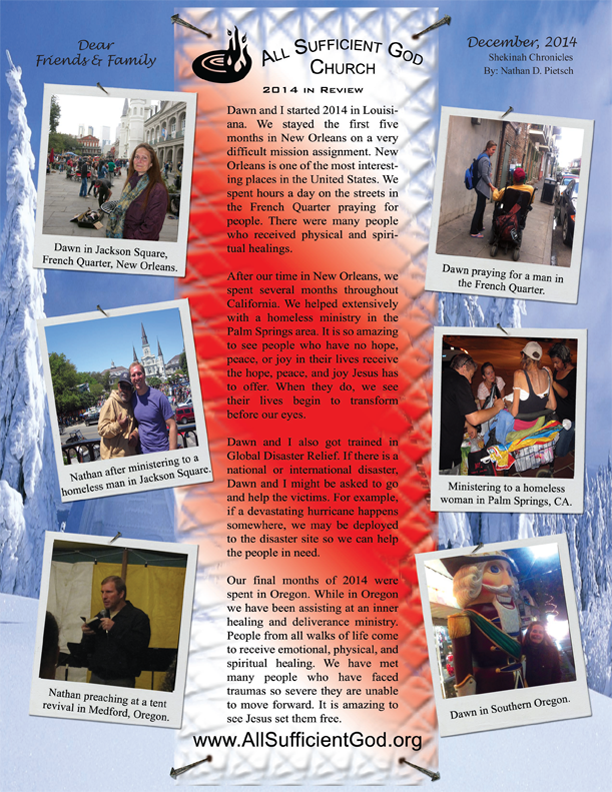 Nathan and Dawn started the year of 2012 in the wonderful city of New Orleans. 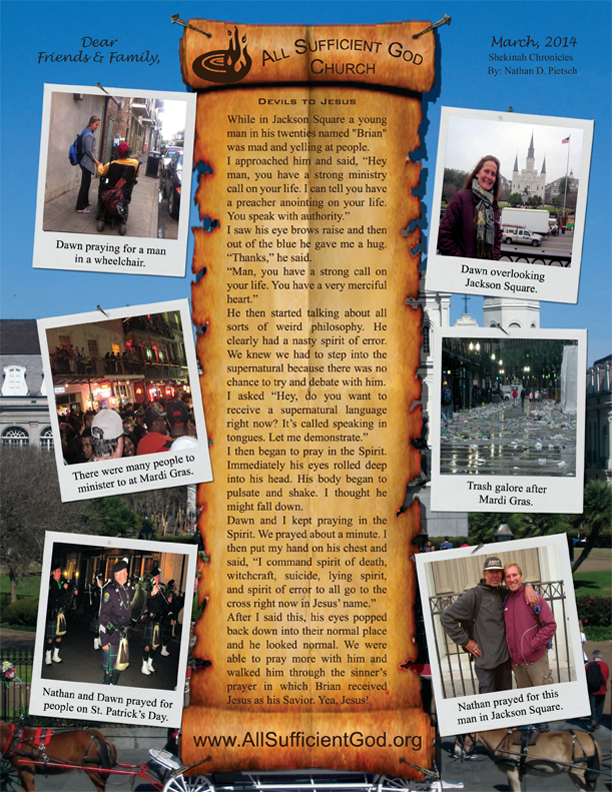 While in New Orleans, they were able to do a huge amount of ministry. They were able to minister to people at the debauchery festivals of Mardi Gras and St. Patrick's Day. 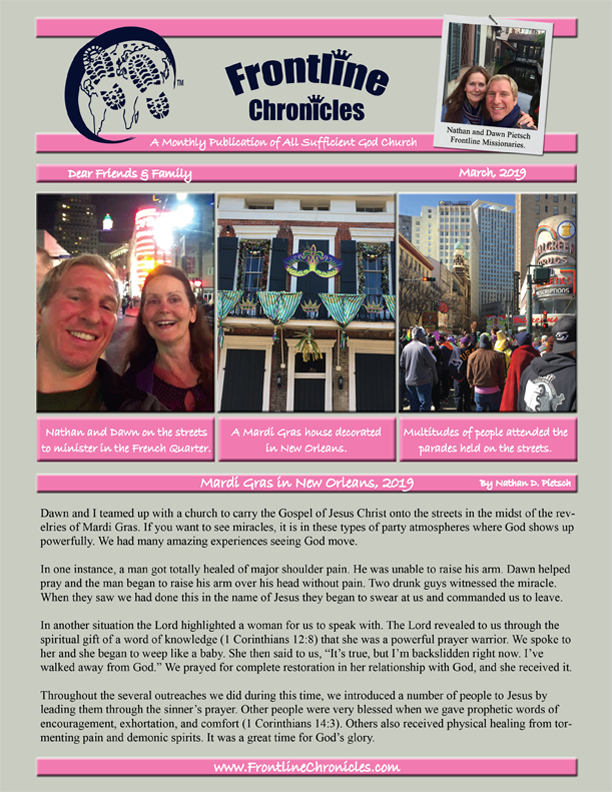 Nathan preached on the streets to the revelers at Mardi Gras. 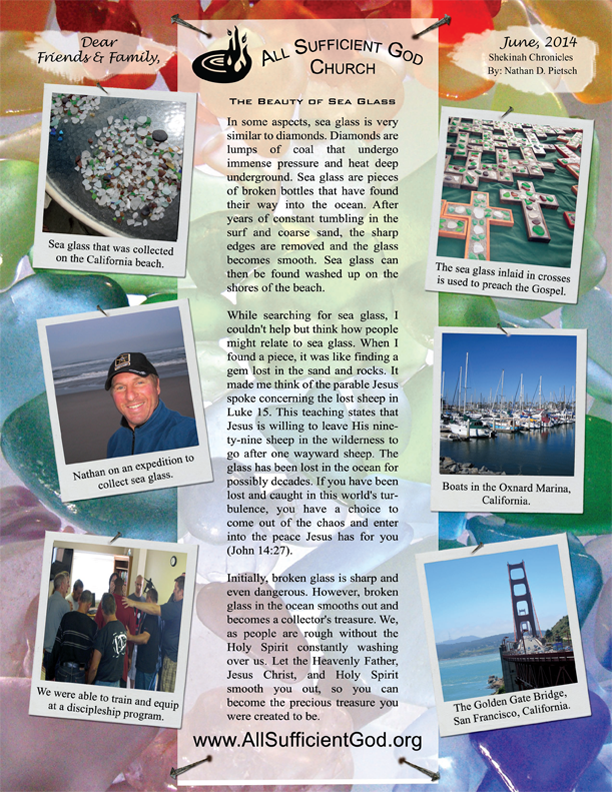 You can read about this and view the photos in the February, 2012 chronicle. 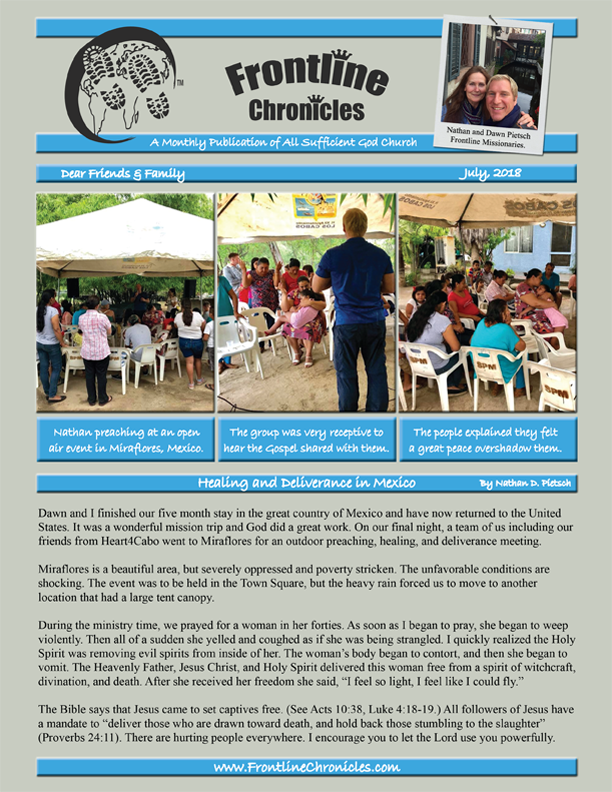 You can also read about their ministry to the people living in the ghetto known as "The Projects." While also in New Orleans, Nathan and Dawn teamed up with the police force known as the "R.E.S.E.T. Program" to minister to the local people following a murder. Unfortunately, New Orleans has one of the highest murder rates per capita in the United States. Nathan and Dawn were escorted into those high crime neighborhoods in police vehicles and undercover cops. You can read about such stories and more by clicking the links below. Download the online version from December, 2012. Not Available. Download a printable PDF version from December, 2012. Download the online version from November, 2012. Not Available. 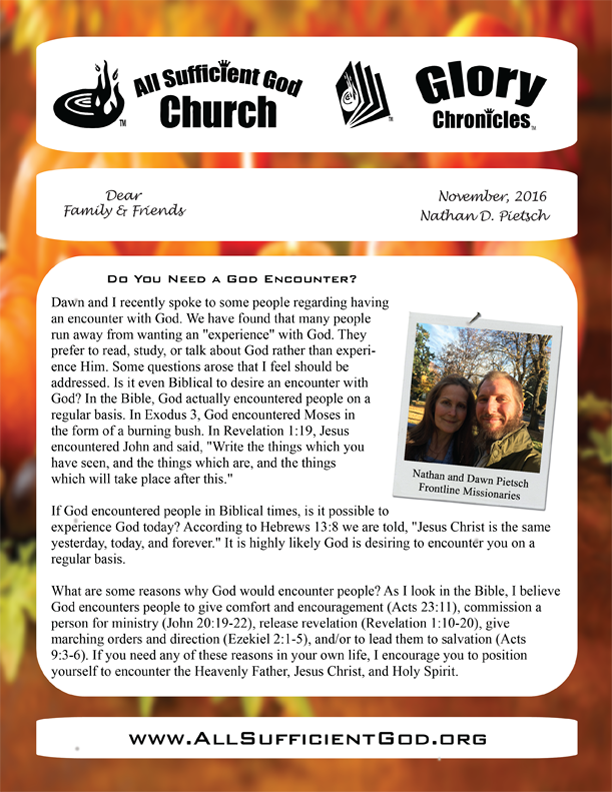 Download a printable PDF version from November, 2012. Download the online version from October, 2012. Not Available. 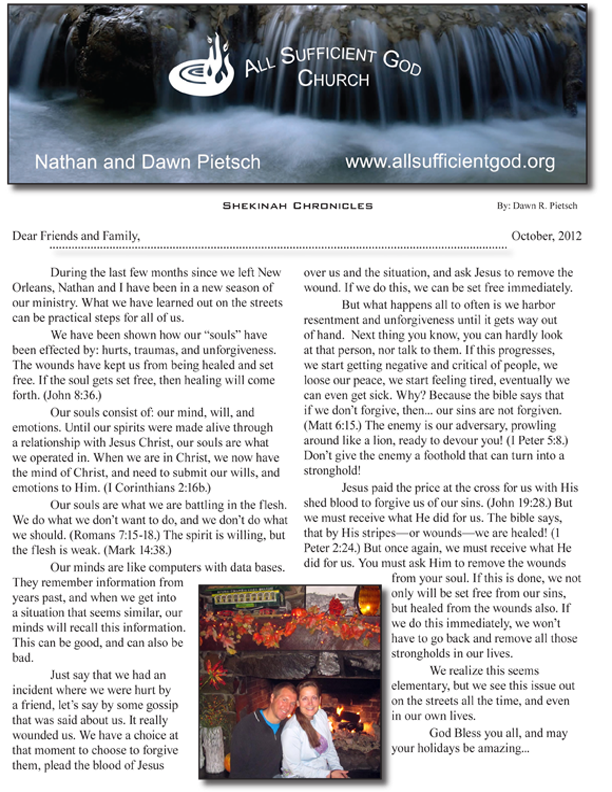 Download a printable PDF version from October, 2012. Download the online version from September, 2012. Not Available. Download a printable PDF version from September, 2012. Download the online version from August, 2012. Not Available. 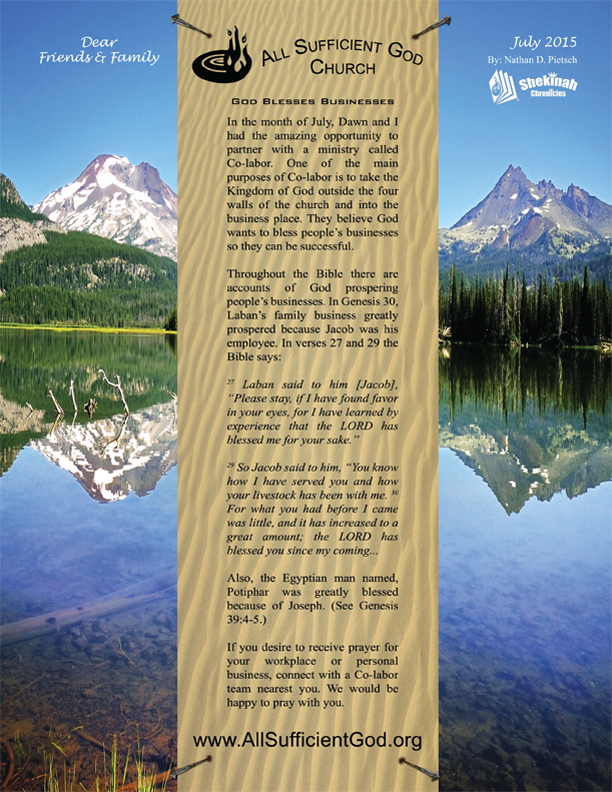 Download a printable PDF version from August, 2012. Download the online version from July, 2012. Not Available. Download a printable PDF version from July, 2012. Download the online version from June, 2012. Not Available. Download a printable PDF version from June, 2012. Download the online version from May, 2012. Not Available. Download a printable PDF version from May, 2012. Download the online version from April, 2012. Not Available. Download a printable PDF version from April, 2012. Download the online version from March, 2012. Not Available. 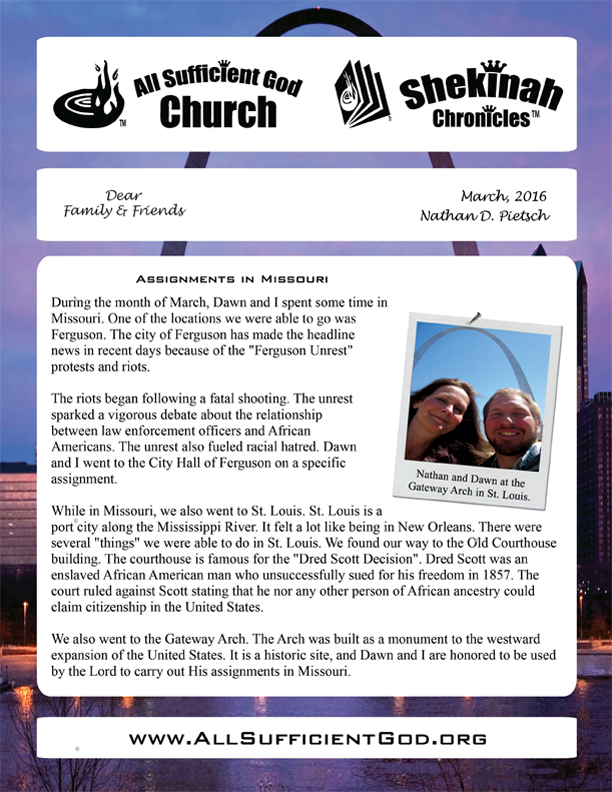 Download a printable PDF version from March, 2012. Download the online version from February, 2012. Not Available. 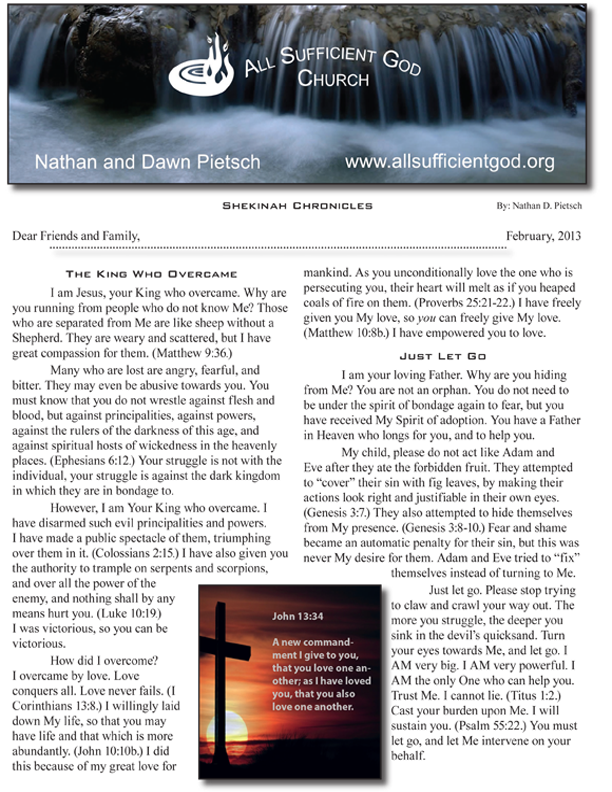 Download a printable PDF version from February, 2012. Download the online version from January, 2012. Not Available. 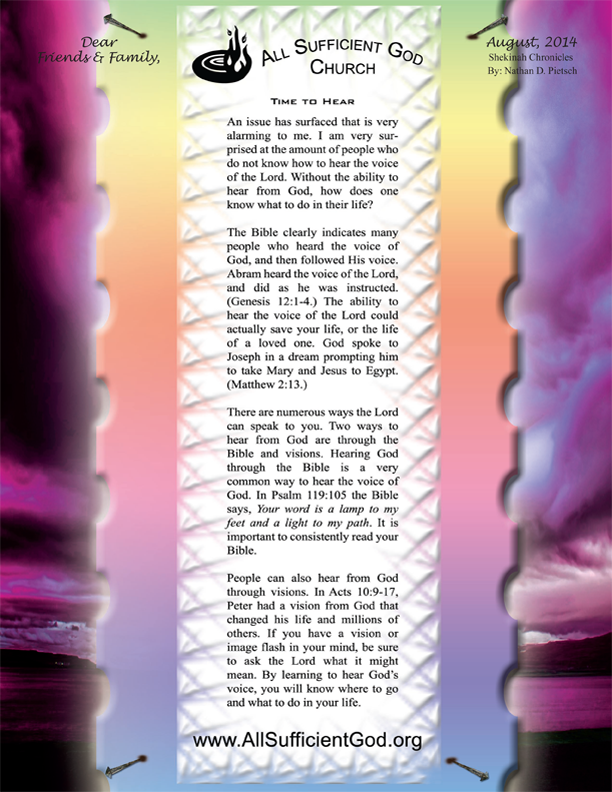 Download a printable PDF version from January, 2012. 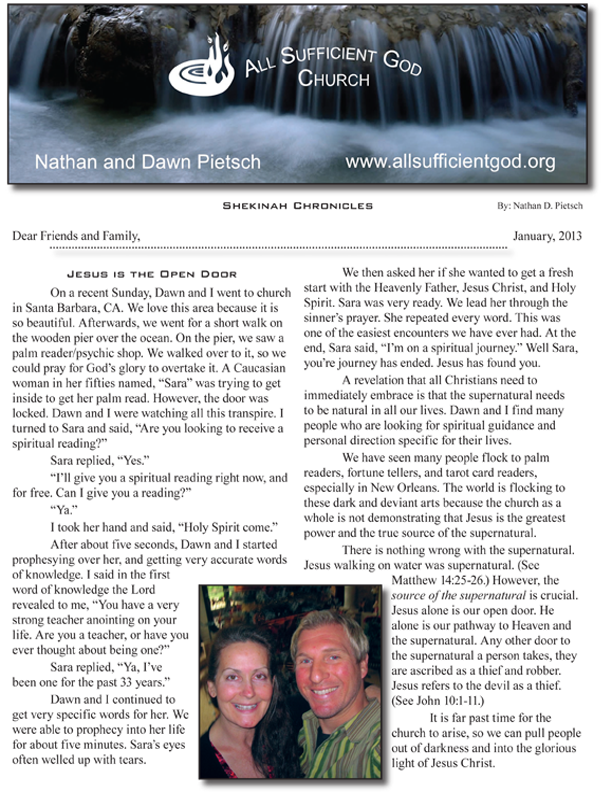 Nathan and Dawn started the year of 2011 on the east coast of the United States in Virginia. 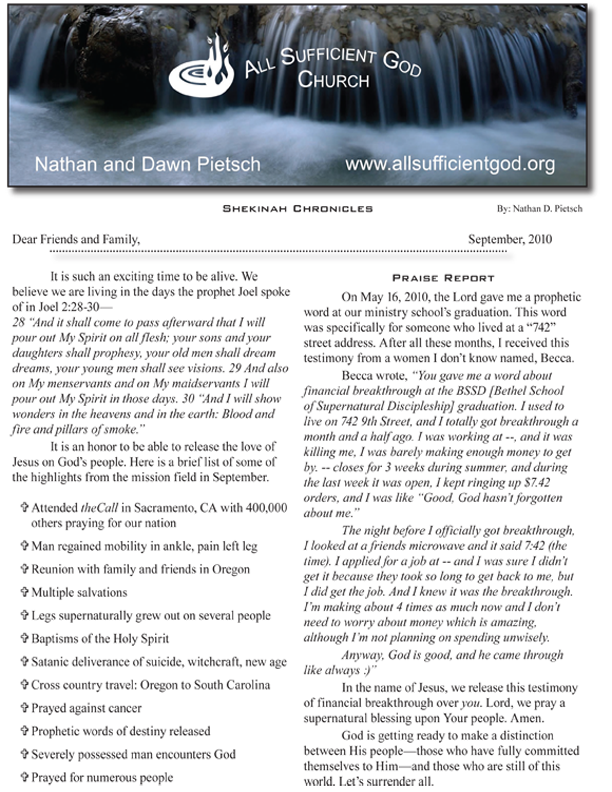 They ministered extensively in Ashland and Richmond. They also discipled teenage youths six days per week for the entire summer months. 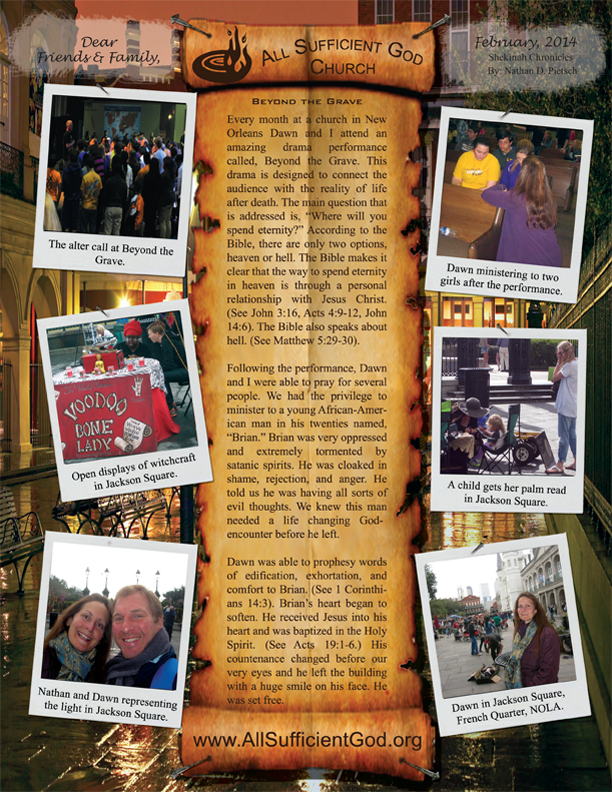 You can read about their ministry experience during a riot at the Final Four NCAA Basketball Tournament. In addition to Virginia, they ministered in Washington D.C., Pennsylvania, and North Carolina. While in North Carolina they traveled to the Billy Graham Training Center at the Cove. They also experienced Moravian Falls, Winston-Salem, Pensacola, Florida, and Mobile, Alabama. At the end of September, the Lord directed them to New Orleans, Louisiana. 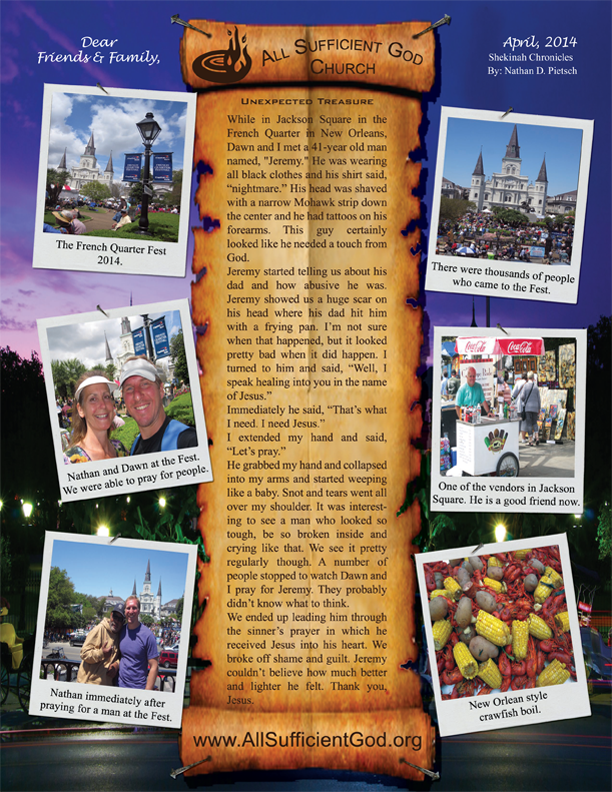 While in New Orleans, they ministered to the crowds on the streets on Halloween night. On that evening in 2011, 16 people were wounded and two died by gun fire. Nathan and Dawn saw one of the men dead lying on the street and witnessed the experience first hand. 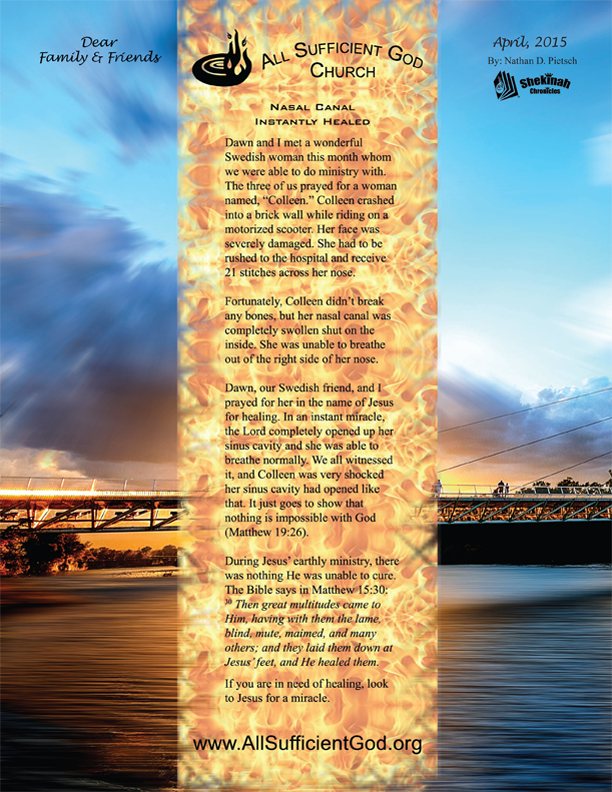 In addition to reading about testimonies from New Orleans, you can learn about their time in Mississippi when the Lord completely healed a man's hurt shoulder. 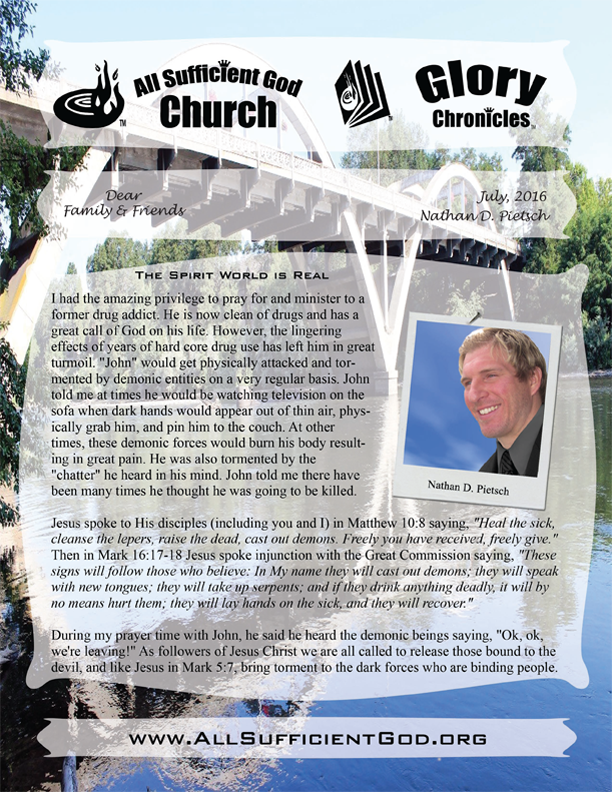 Finally, in the December chronicle you will shocked about their ministry experience with a man who was premeditating to murder his own father. Download the online version from December, 2011. Not Available. Download a printable PDF version from December, 2011. Download the online version from November, 2011. Not Available. 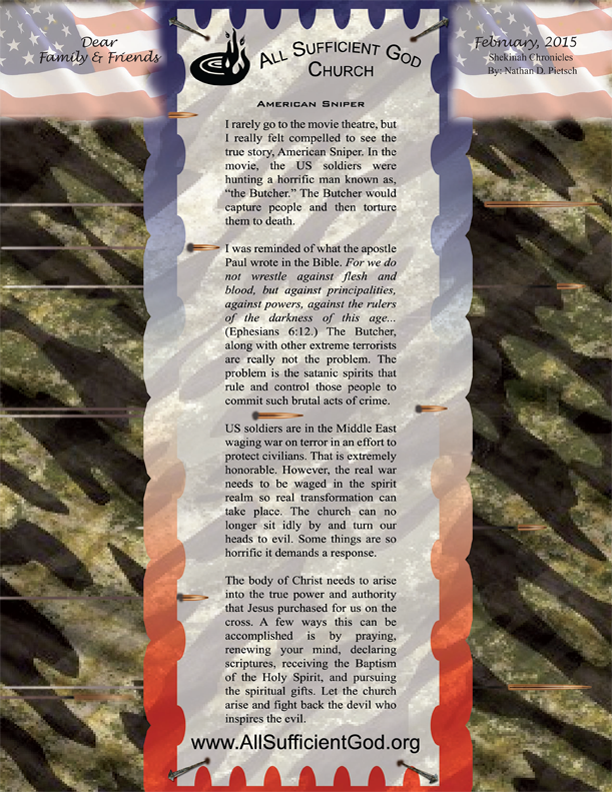 Download a printable PDF version from November, 2011. Download the online version from October, 2011. Not Available. 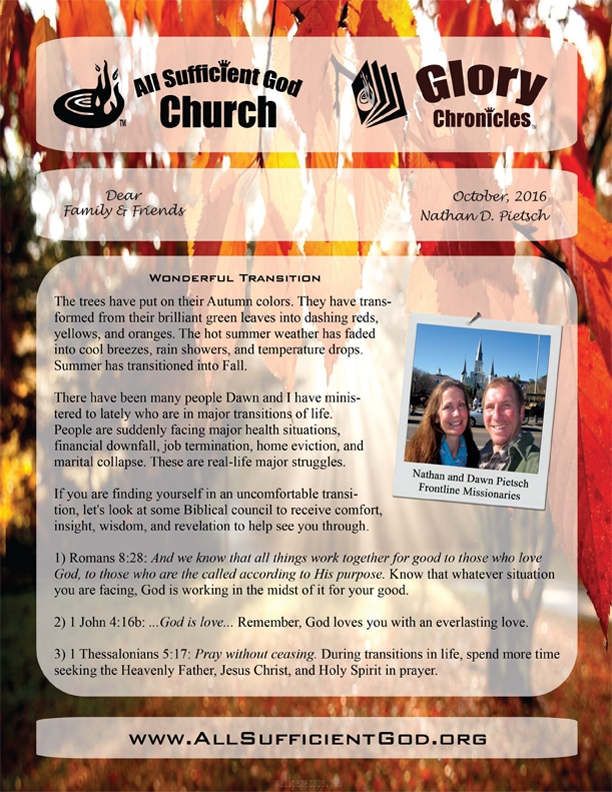 Download a printable PDF version from October, 2011. Download the online version from September, 2011. Not Available. Download a printable PDF version from September, 2011. Download the online version from August, 2011. Not Available. Download a printable PDF version from August, 2011. Download the online version from July, 2011. Not Available. Download a printable PDF version from July, 2011. Download the online version from June, 2011. Not Available. 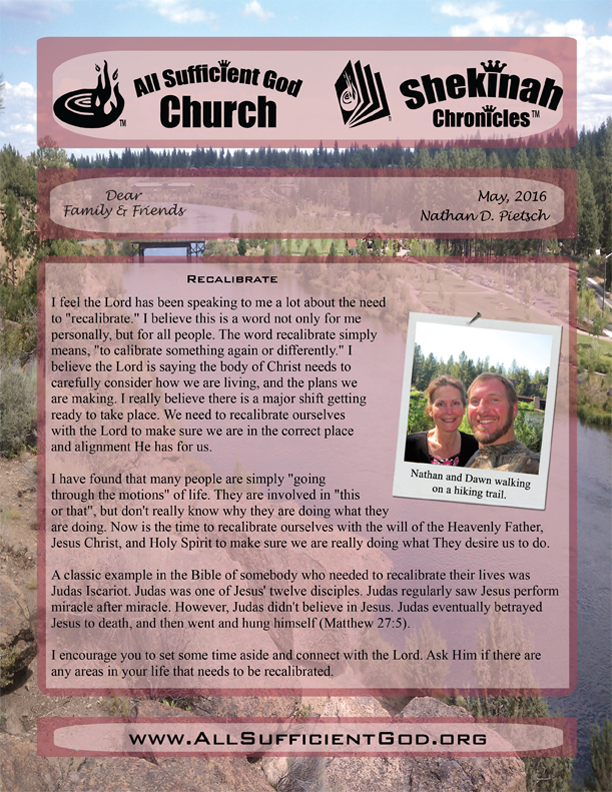 Download a printable PDF version from June, 2011. Download the online version from May, 2011. Not Available. Download a printable PDF version from May, 2011. Download the online version from April, 2011. Not Available. Download a printable PDF version from April, 2011. Download the online version from March, 2011. Not Available. 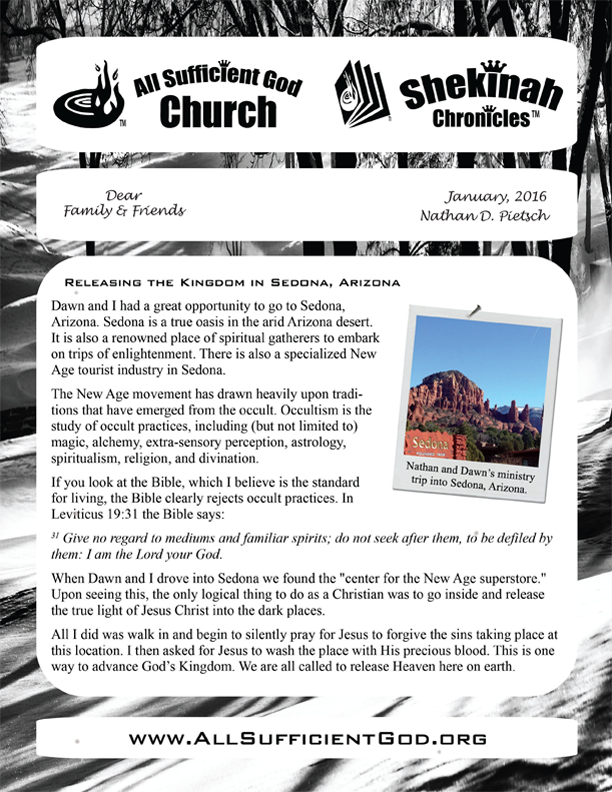 Download a printable PDF version from March, 2011. Download the online version from February, 2011. Not Available. 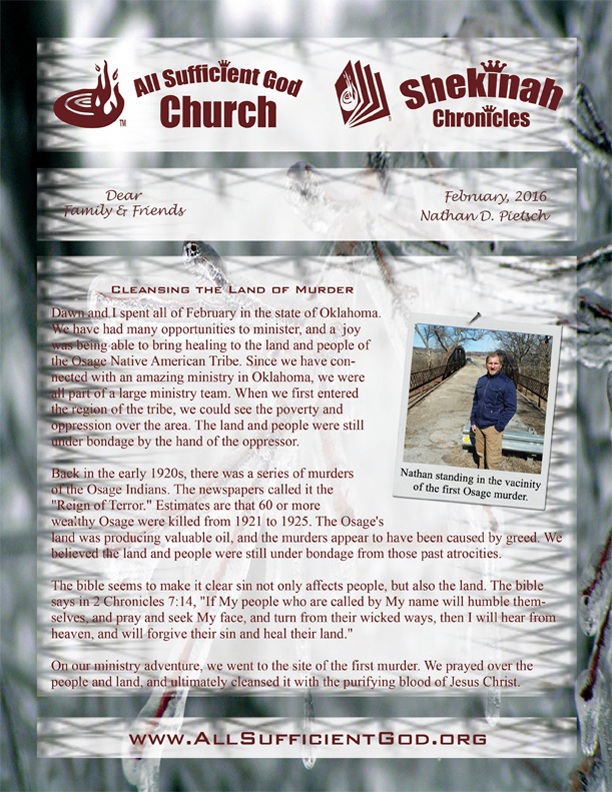 Download a printable PDF version from February, 2011. Download the online version from January, 2011. Not Available. 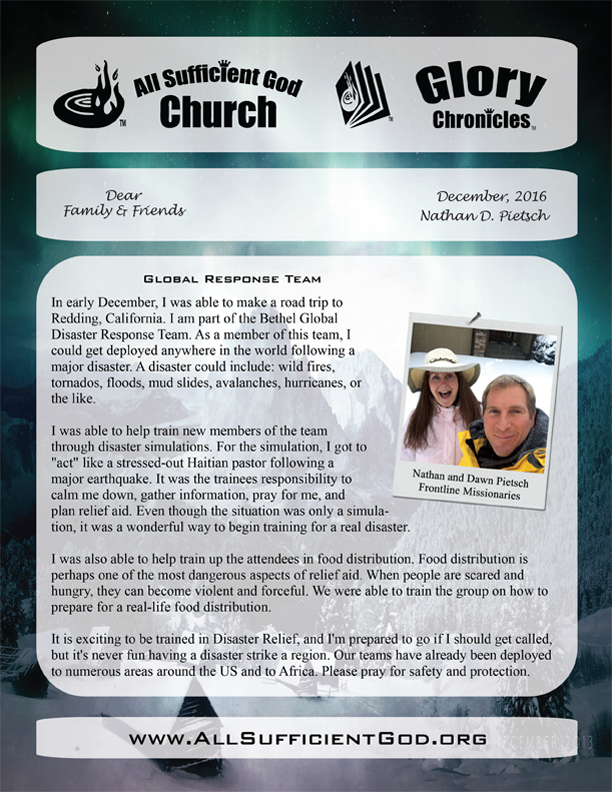 Download a printable PDF version from January, 2011. Frontline Chronicles officially started in July, 2010. 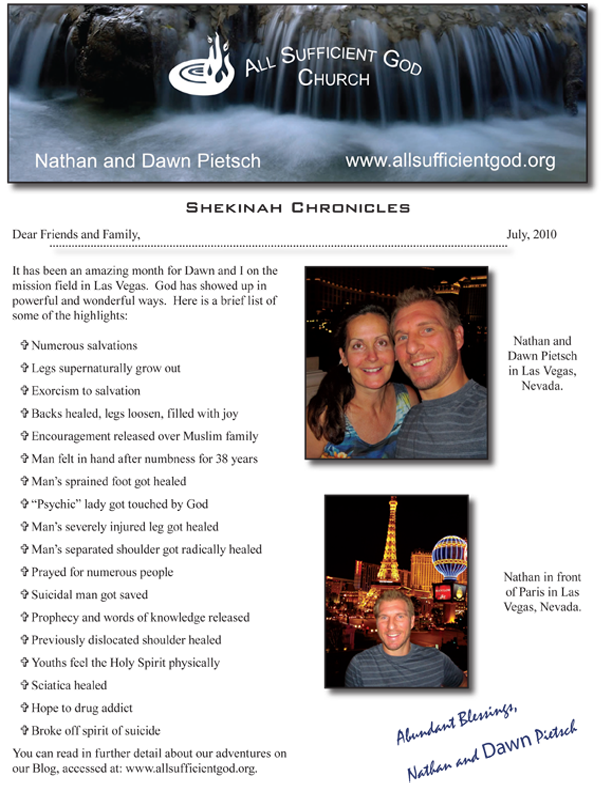 The stories begin when frontline missionaries, Nathan and Dawn Pietsch go to Las Vegas, Nevada. 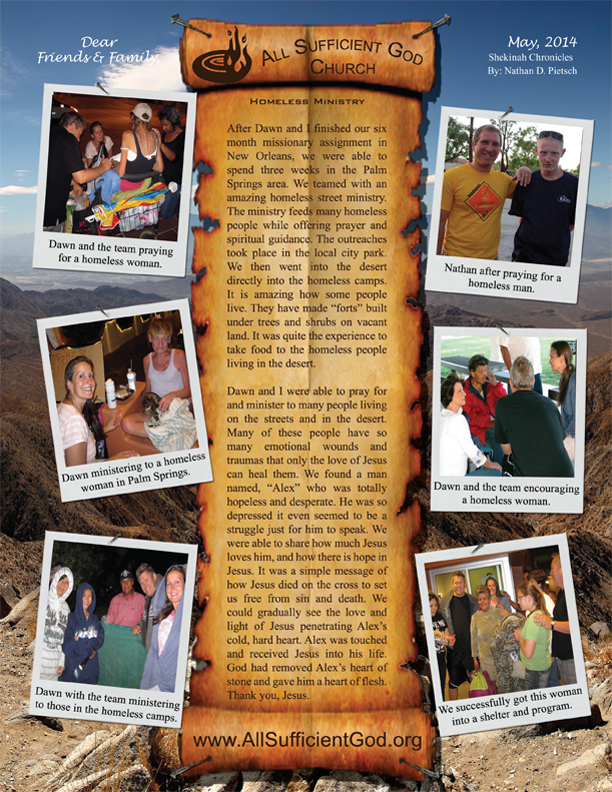 While in Las Vegas, they ministered to people on the streets eight hours a night, six days per week. They saw numerous physical, emotional, and spiritual healings, in which you can read about below. They also encountered Criss Angel on two seperate occassions, in which they released the Kingdom of Heaven over him. They also started their cross country journey when they departed from Oregon and traveled to South Carolina. They eventually traveled north on the east coast all the way to New York City. You will find testimonies from North Carolina, Virginia, Washington D.C., New Jersey, and New York when you click the links below. Download the online version from December, 2010. Not Available. Download a printable PDF version from December, 2010. Download the online version from November, 2010. Not Available. 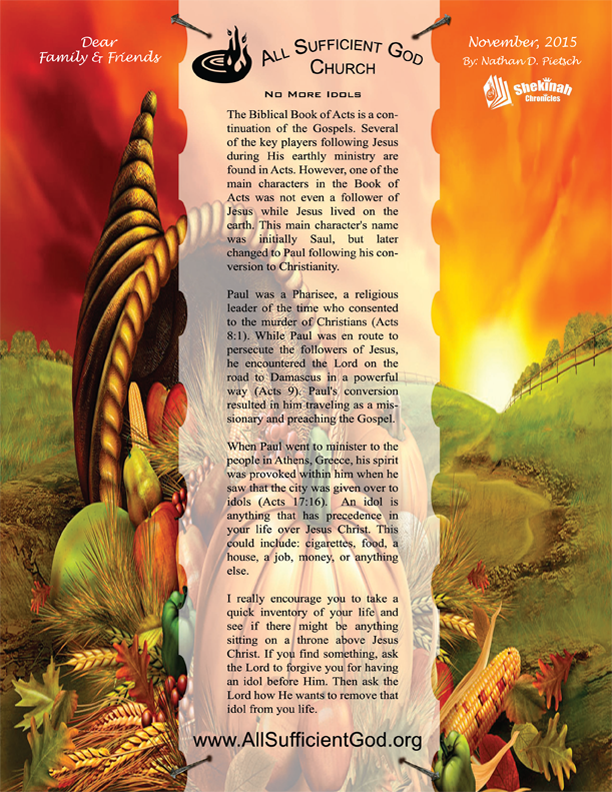 Download a printable PDF version from November, 2010. Download the online version from October, 2010. Not Available. Download a printable PDF version from October, 2010. Download the online version from September, 2010. Not Available. Download a printable PDF version from September, 2010. Download the online version from August, 2010. Not Available. Download a printable PDF version from August, 2010. Download the online version from July, 2010. Not Available. Download a printable PDF version from July, 2010. Download the online version from June, 2010. Not Available. Download a printable PDF version from June, 2010. Not Available. Download the online version from May, 2010. Not Available. Download a printable PDF version from May, 2010. Not Available. Download the online version from April, 2010. Not Available. Download a printable PDF version from April, 2010. Not Available. Download the online version from March, 2010. Not Available. 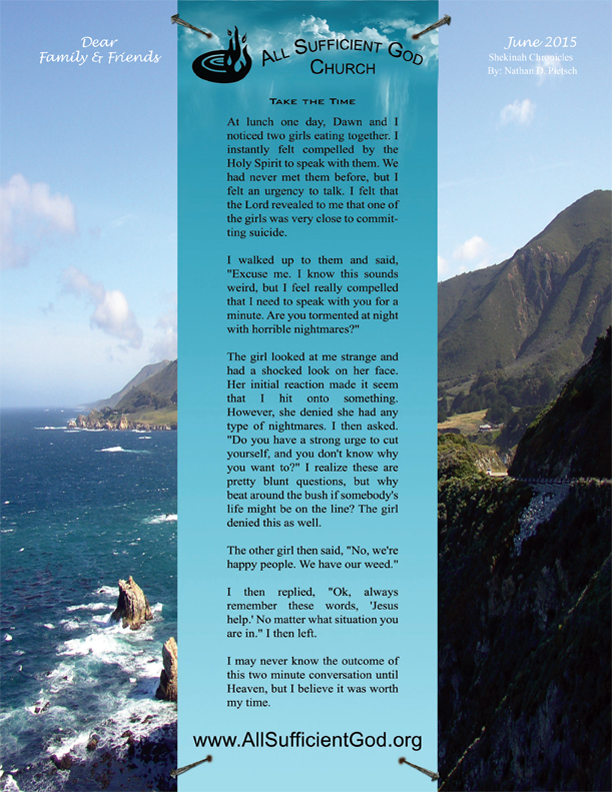 Download a printable PDF version from March, 2010. Not Available. Download the online version from February, 2010. Not Available. Download a printable PDF version from February, 2010. Not Available. Download the online version from January, 2010. Not Available. Download a printable PDF version from January, 2010. 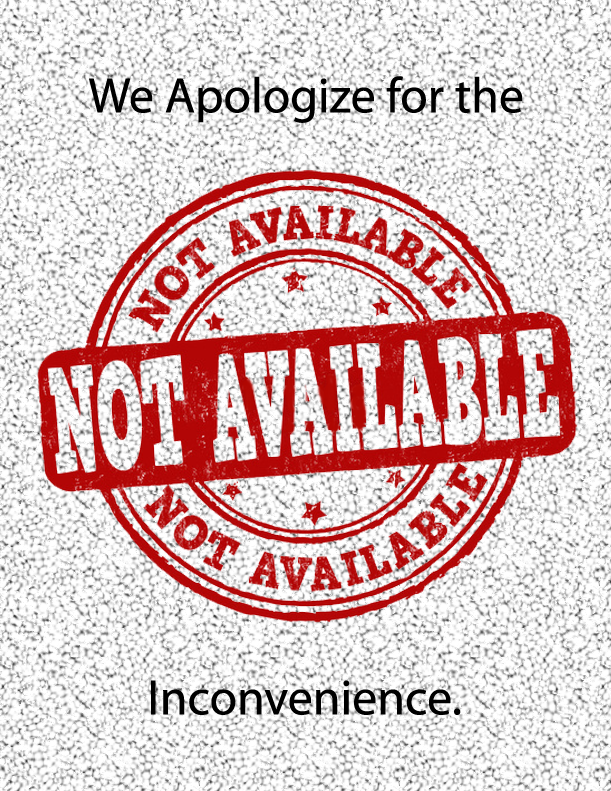 Not Available. 4). Start house churches and home groups. 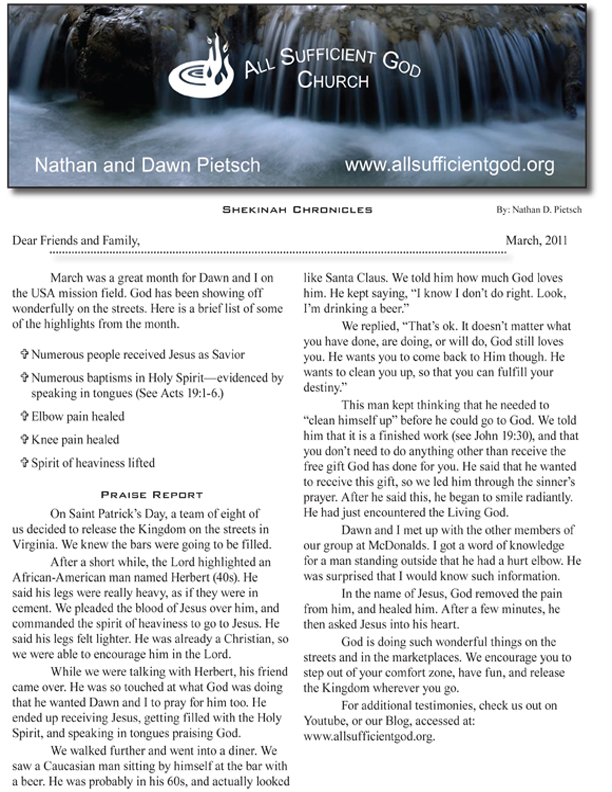 If you would like to sponsor or invite Nathan and Dawn to go to your church or region, please contact them at: www.allsufficientgod.org/contact.php. 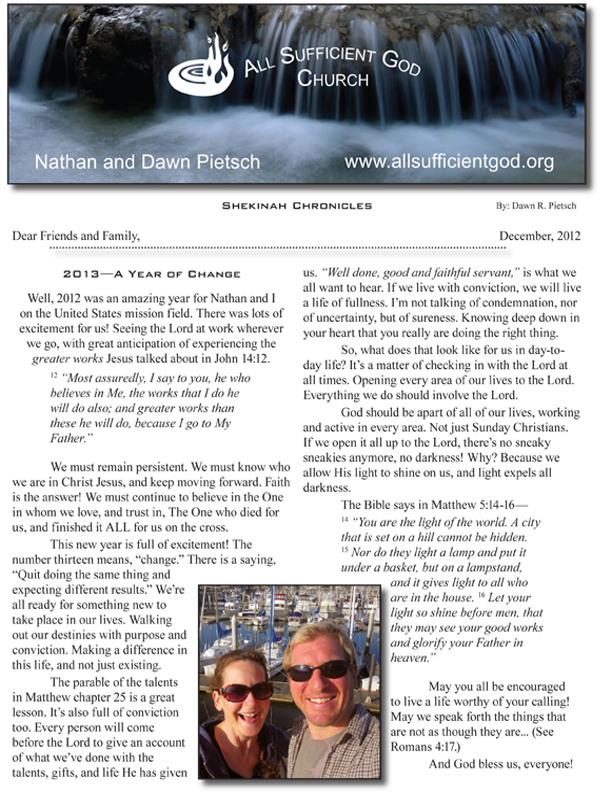 Nathan and Dawn Pietsch are frontline missionaries, and they need your prayers! If you are led to join in prayer coverage for Nathan and Dawn, please visit www.allsufficientgod.org. All Sufficient God Church is a non-profit organization, which enables any contributions to qualify as tax-deductible. If you would like to make a tax-deductible donation please visit: www.allsufficientgod.org/give.php.